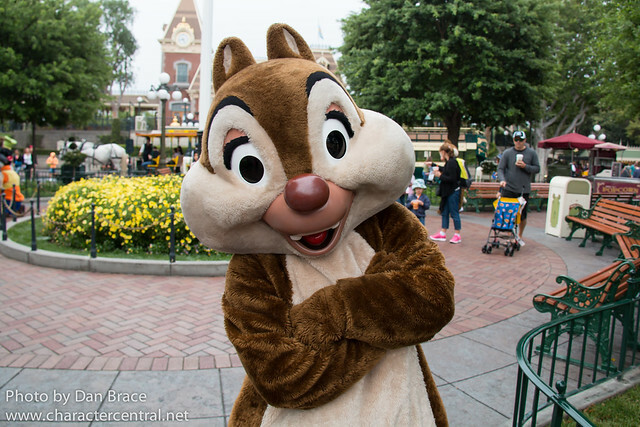 On Main Street USA in Disneyland park, we met Mickey Mouse, Minnie Mouse, Donald Duck, Chip 'n' Dale, Daisy Duck, Goofy and Pluto. 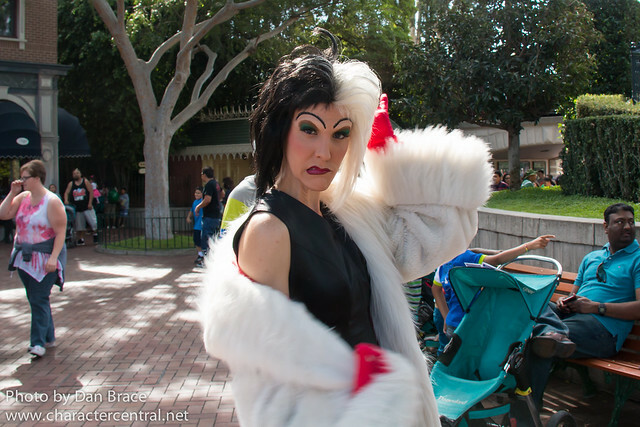 We also ran into Cruella de Vil. 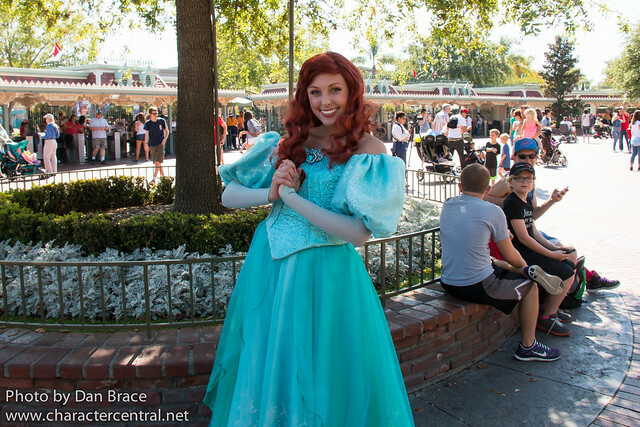 We also saw Ariel, and ran into Mulan, who we didn't meet as she was just leaving when we saw her. 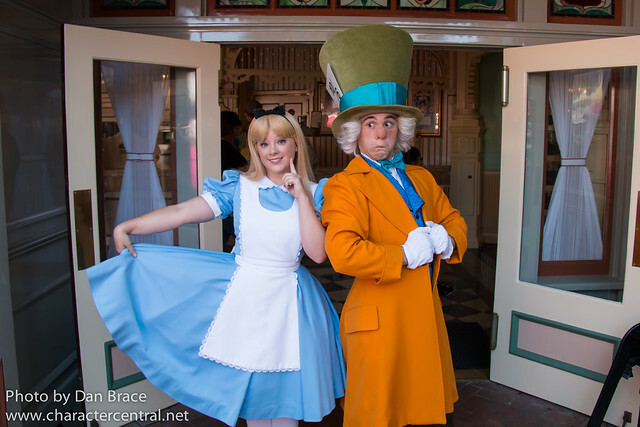 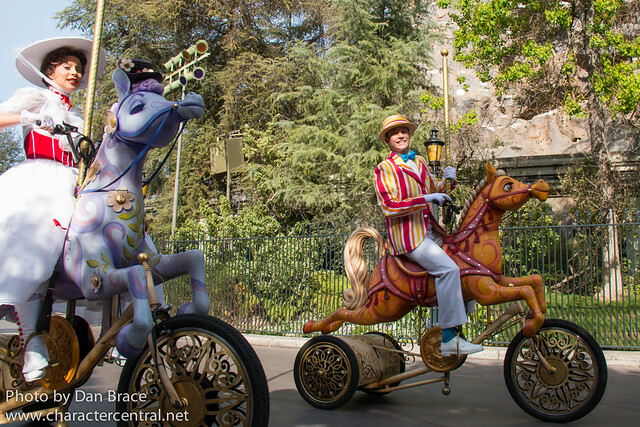 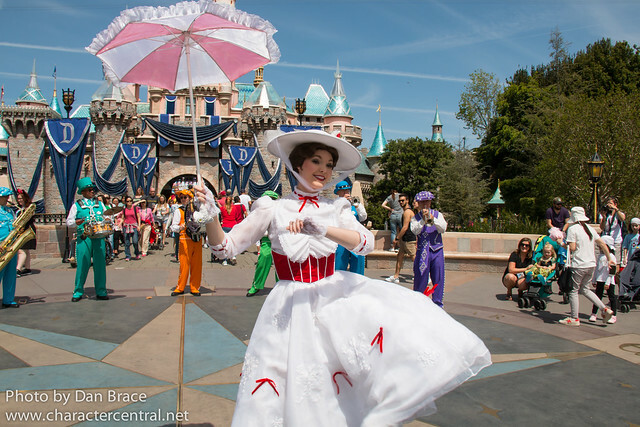 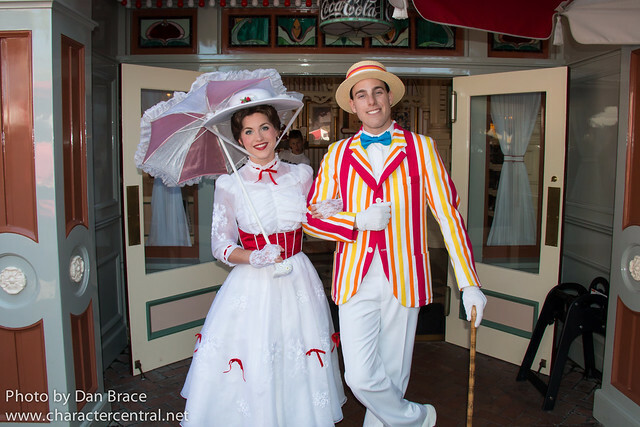 At Refreshment Corner, we met Mary Poppins and Bert, and Alice and the Mad Hatter. 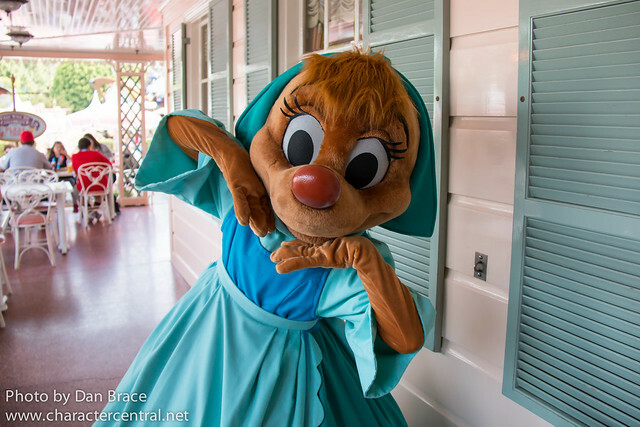 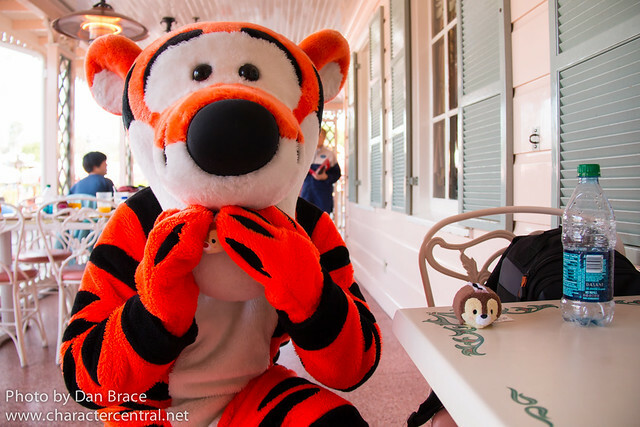 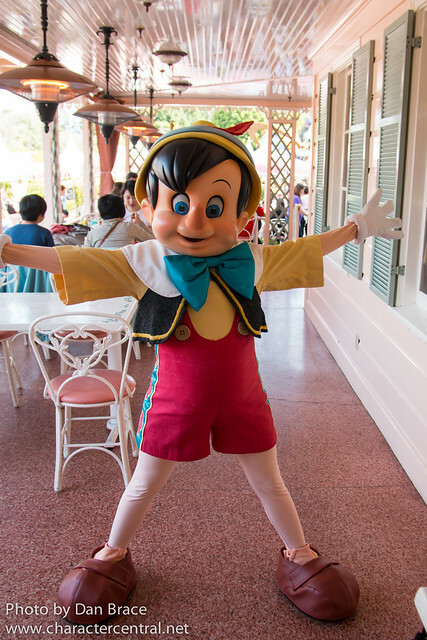 We had breakfast at the Plaza Inn, which is always very magical and filled with lots of characters. 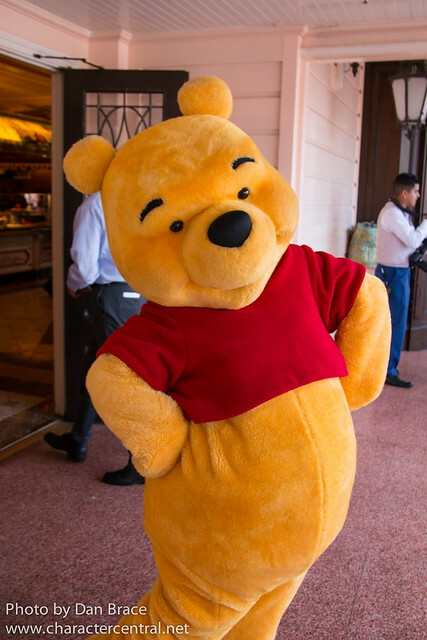 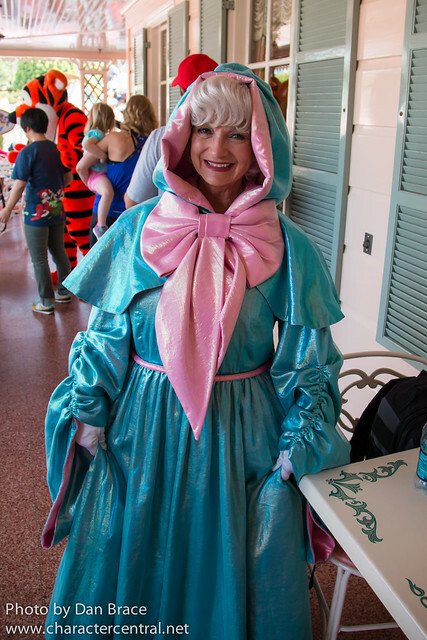 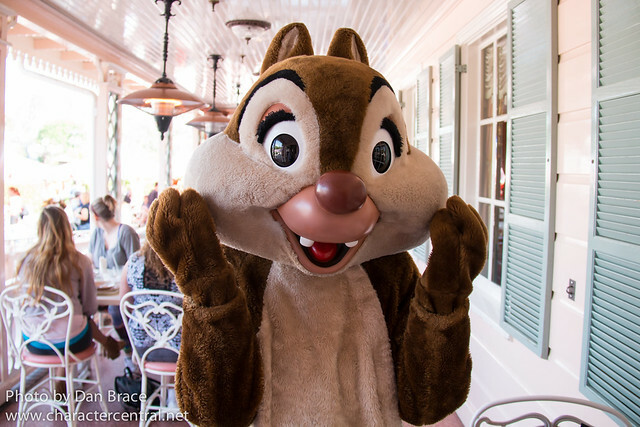 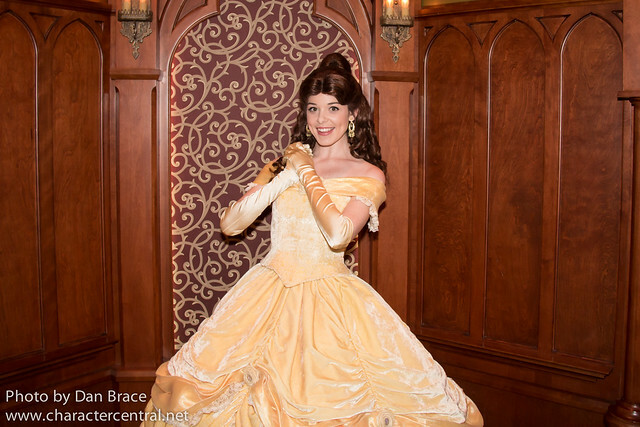 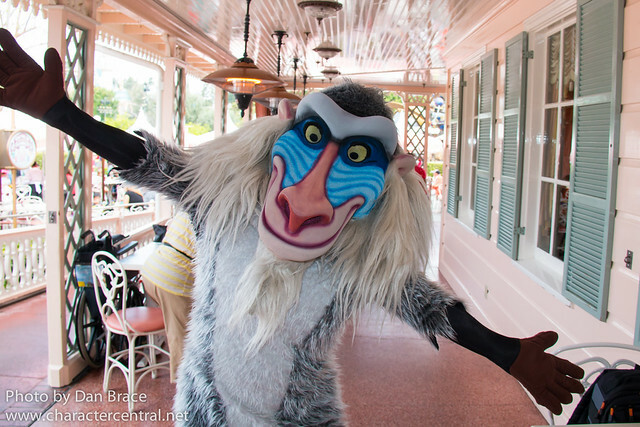 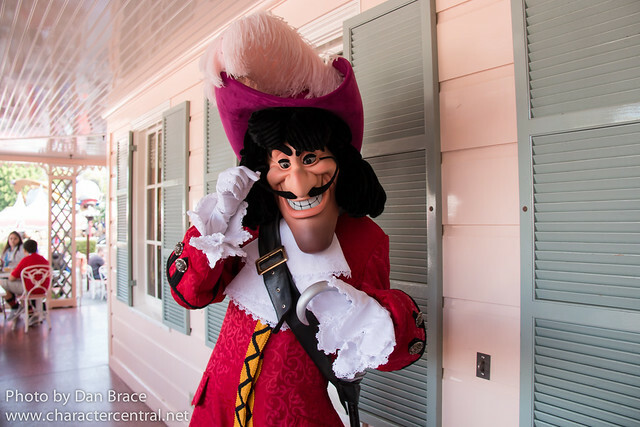 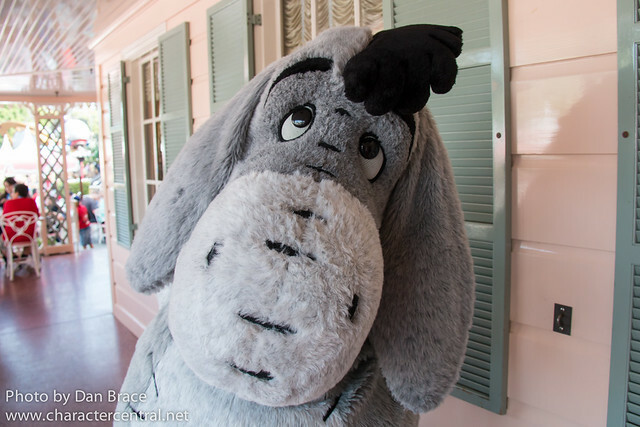 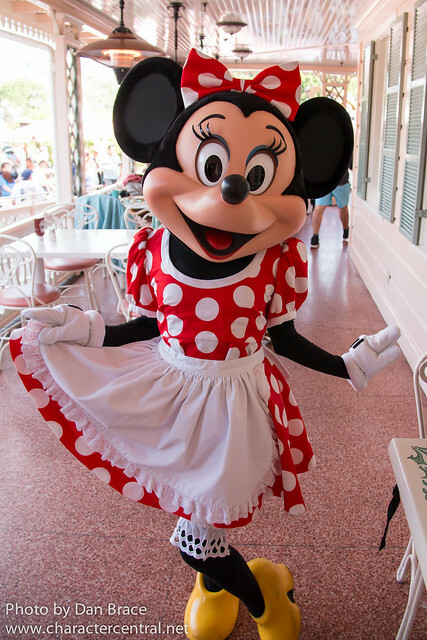 The cast members at the Plaza Inn are some of the nicest people we know. 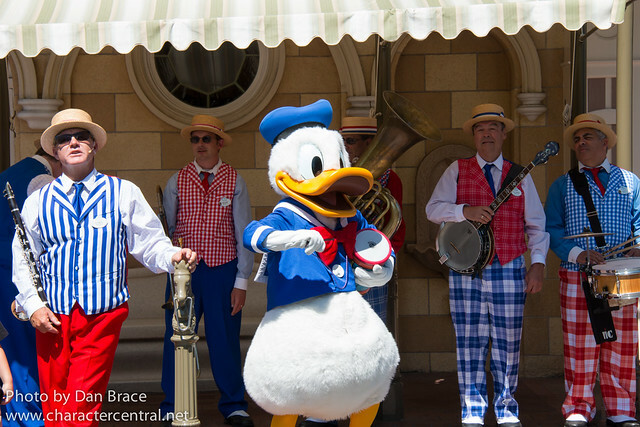 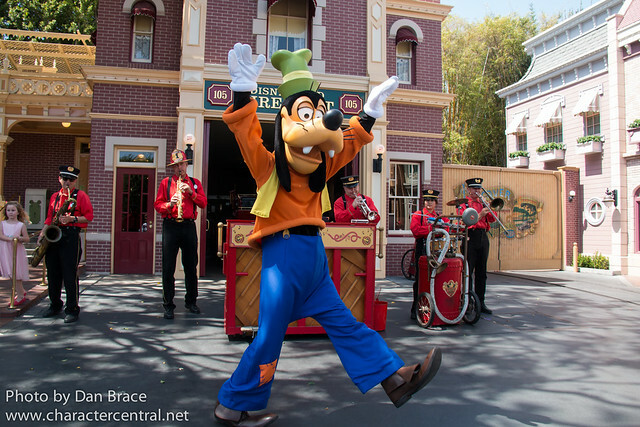 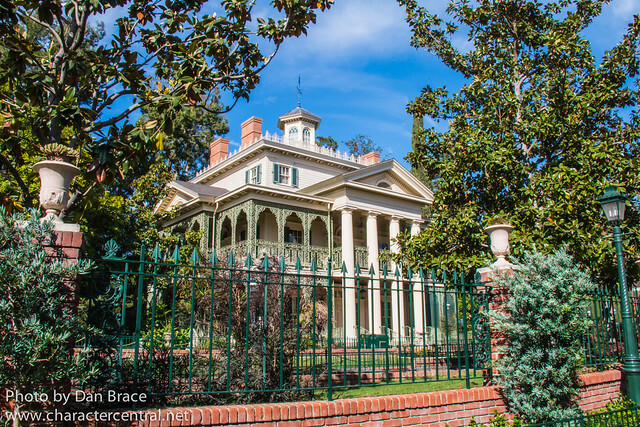 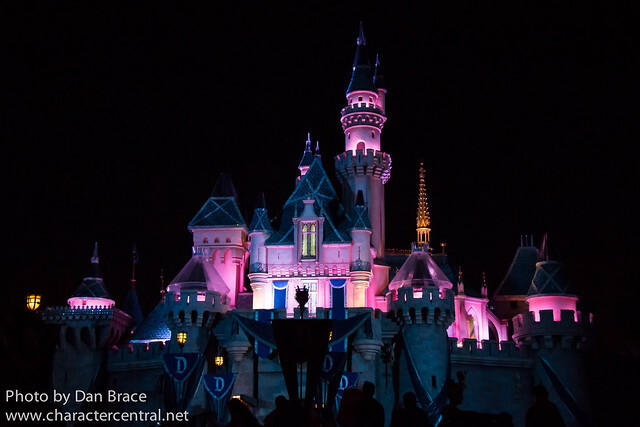 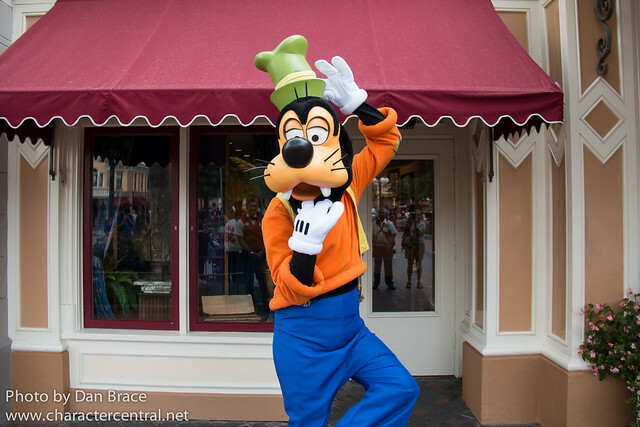 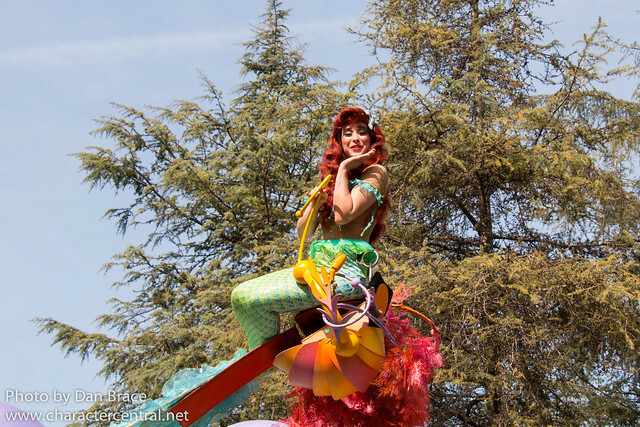 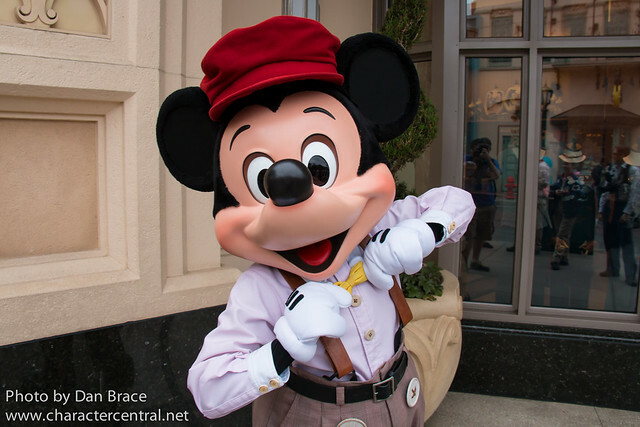 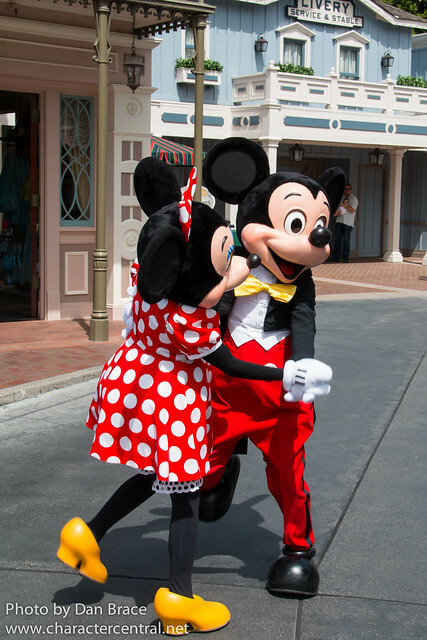 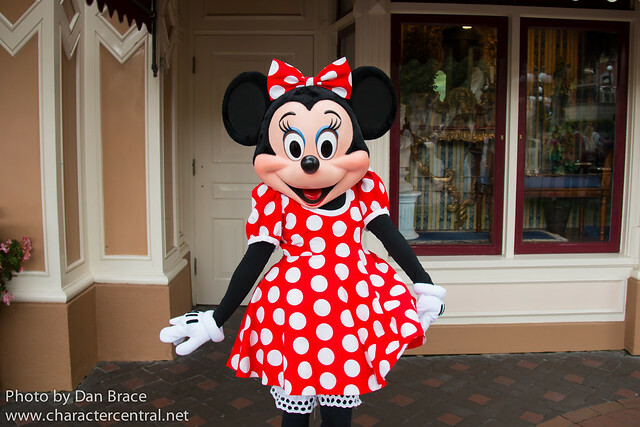 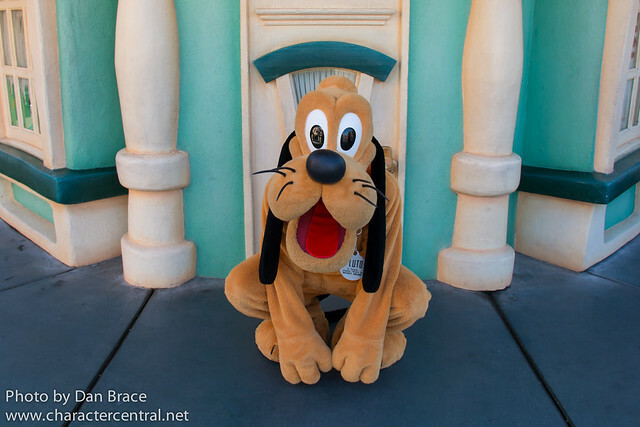 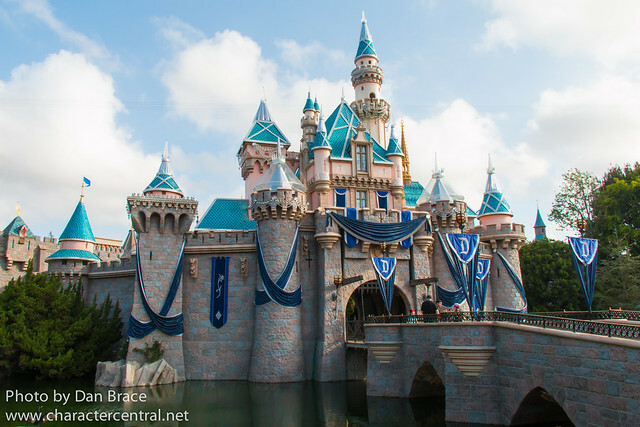 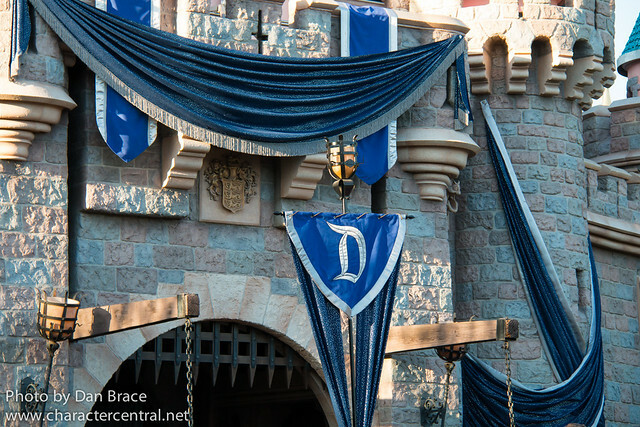 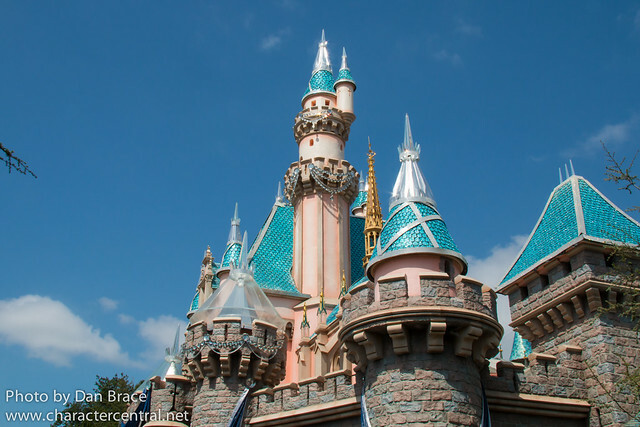 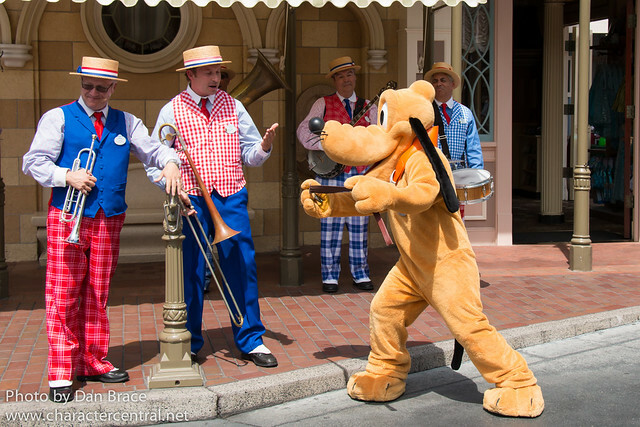 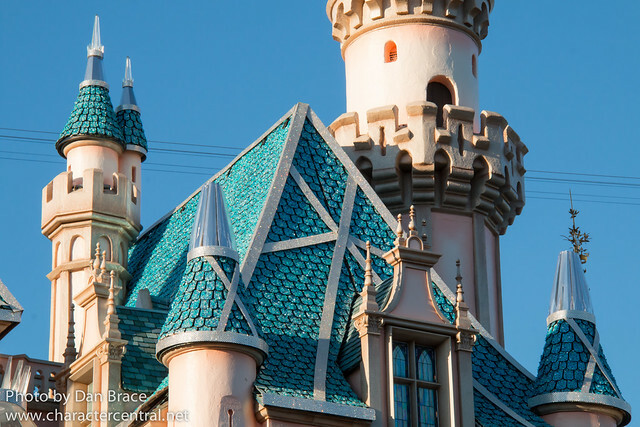 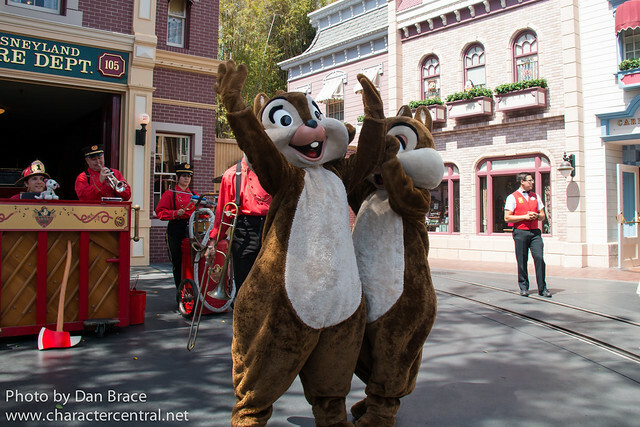 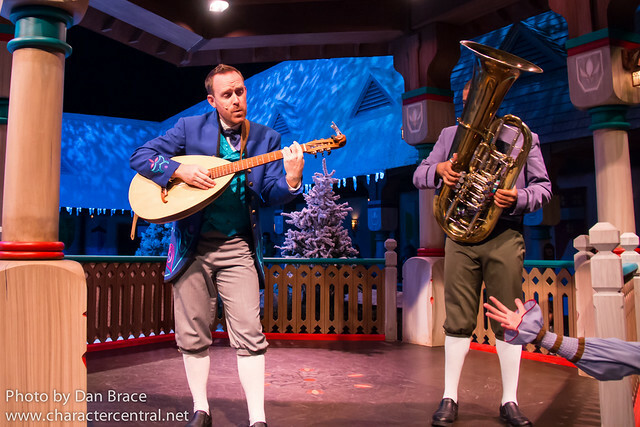 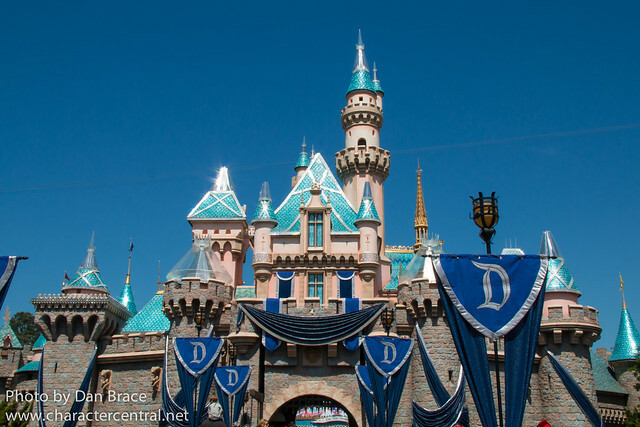 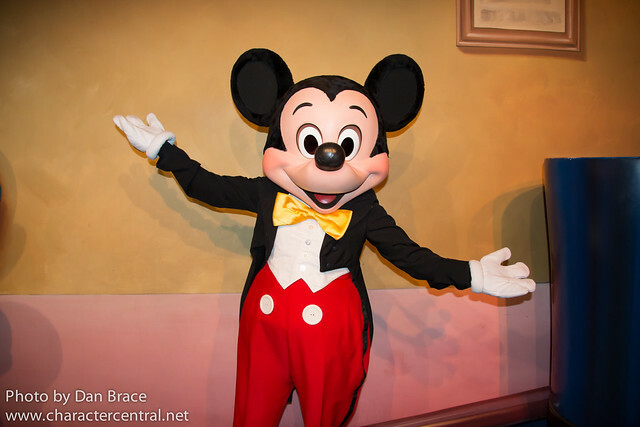 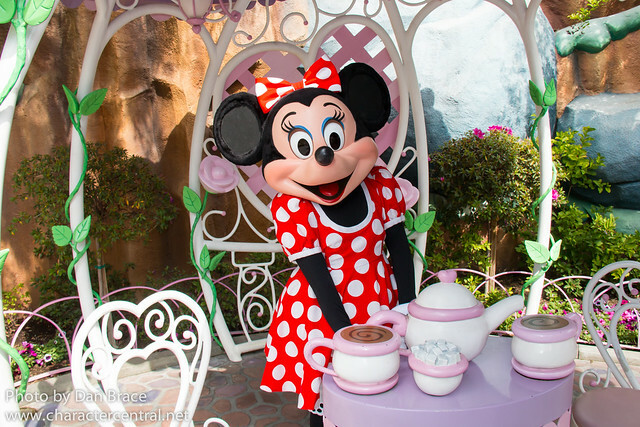 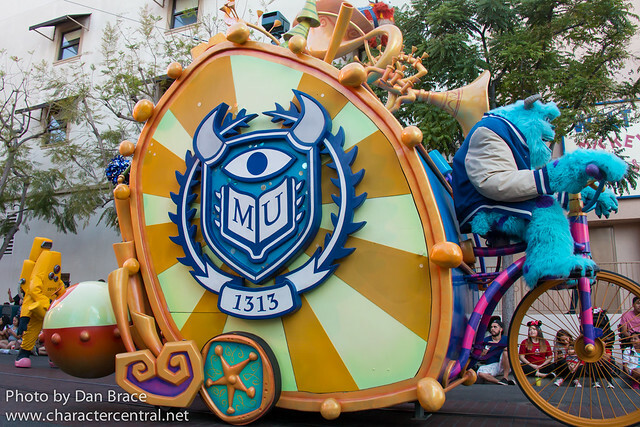 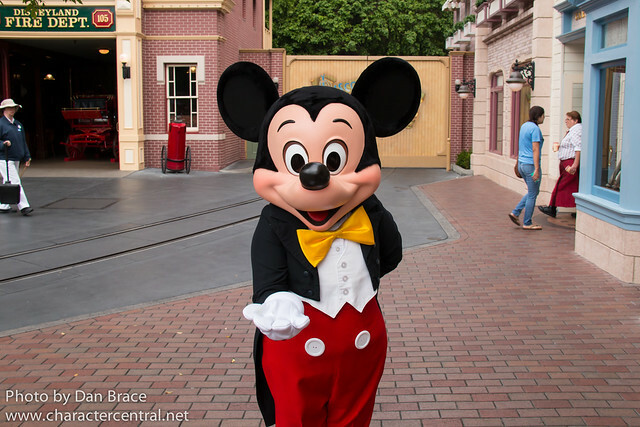 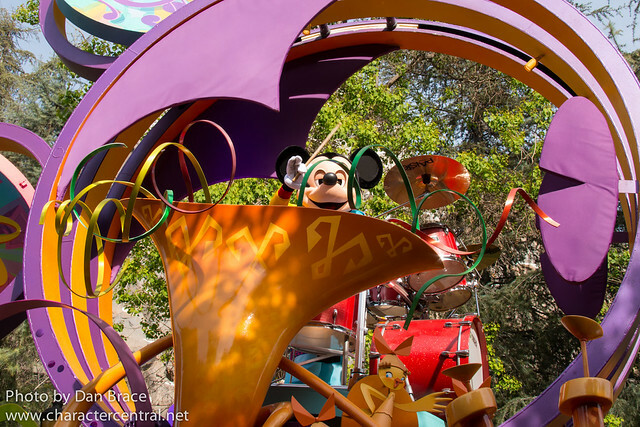 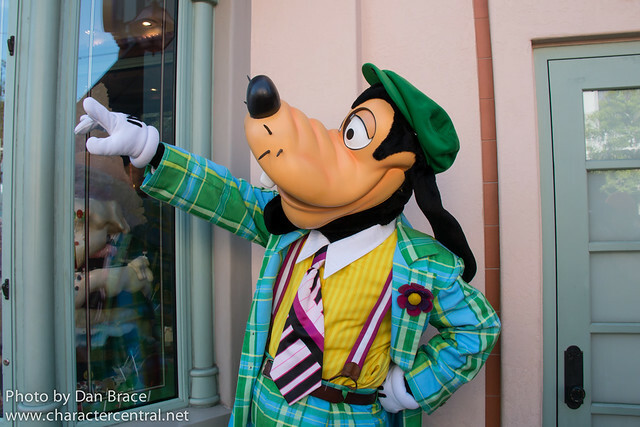 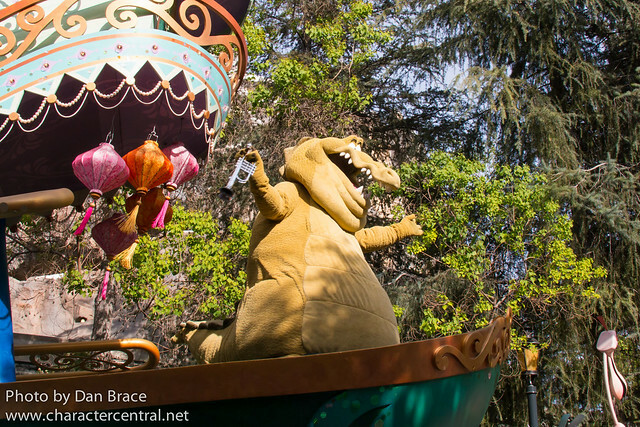 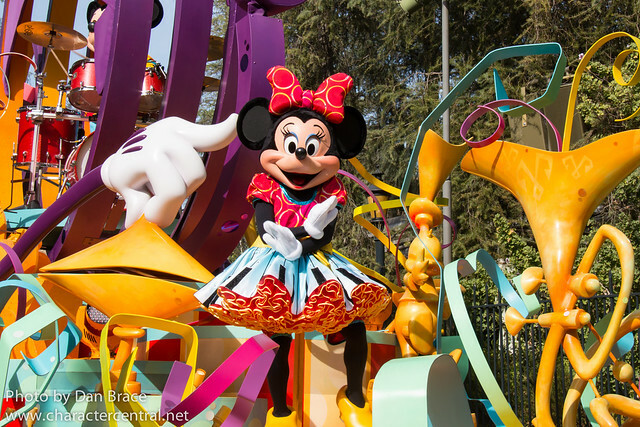 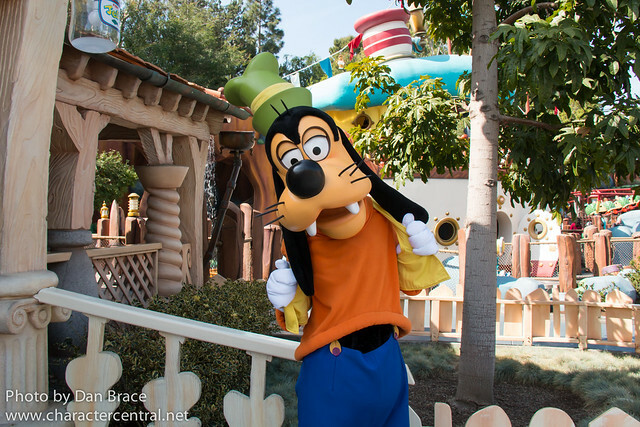 Disneyland is renowned for the sheer volume of live entertainment it hosts, and this trip we decided to try to see as much of it as we could, since we don't always get chance on shorter trips. 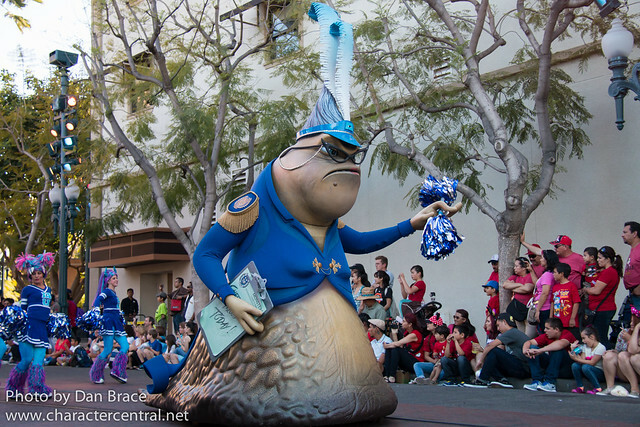 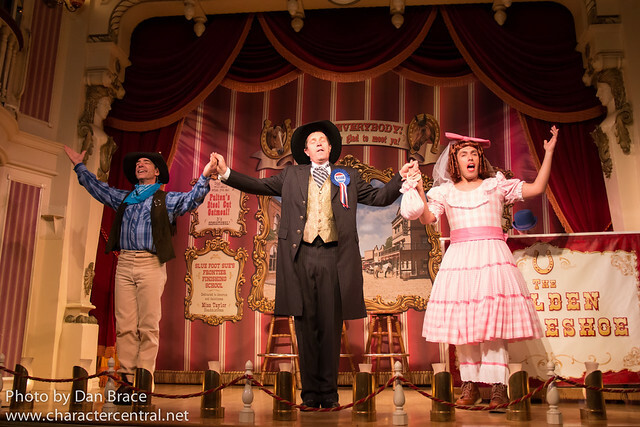 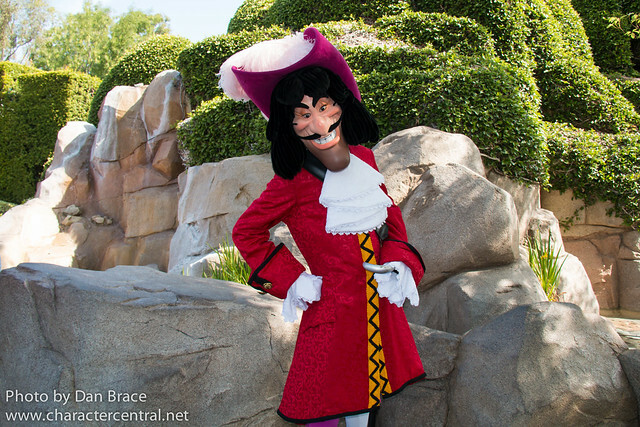 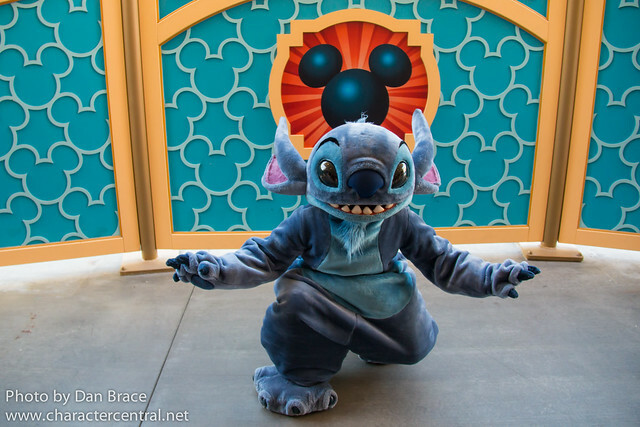 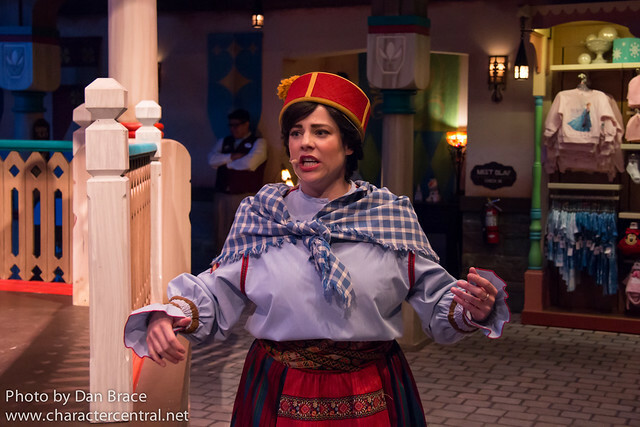 What I love about entertainment at Disneyland is that quite often the characters will appear in the performances, which really adds something special. 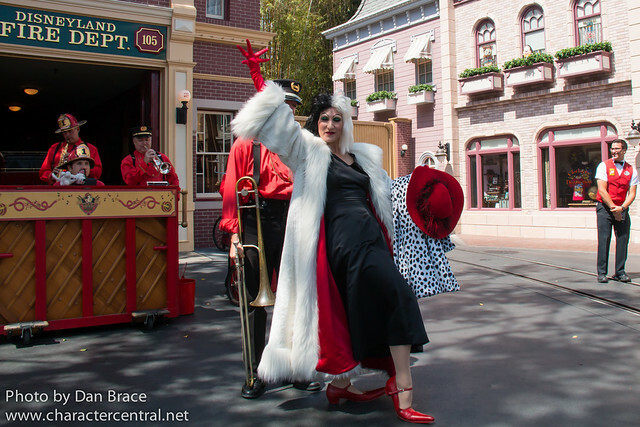 We saw the Disneyland Band, Hook and Ladder Co., the Straw Hatters the Dapper Dans, the Ragtime Pianist, Musical Chairs and the Pearly Band. 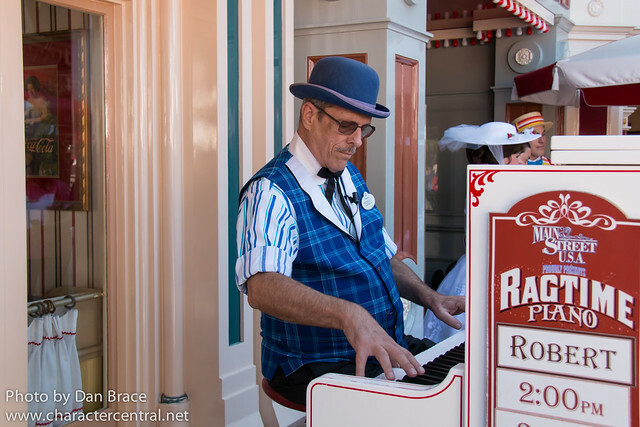 I don't have my pictures of the Disneyland Band edited yet, so there won't be any below. 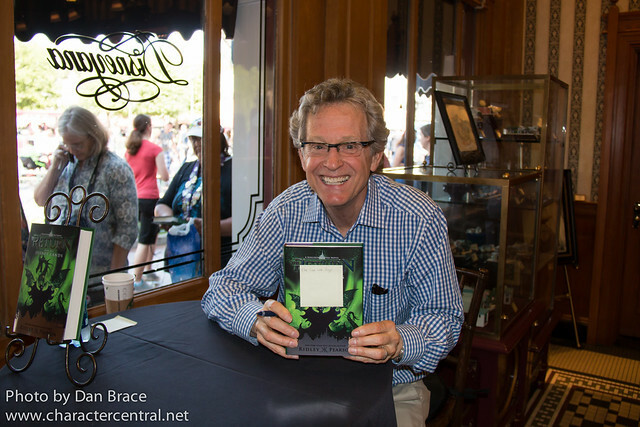 On our first day in the park, Disney novelist Ridley Pearson was signing books at Disneyana in Town Square. 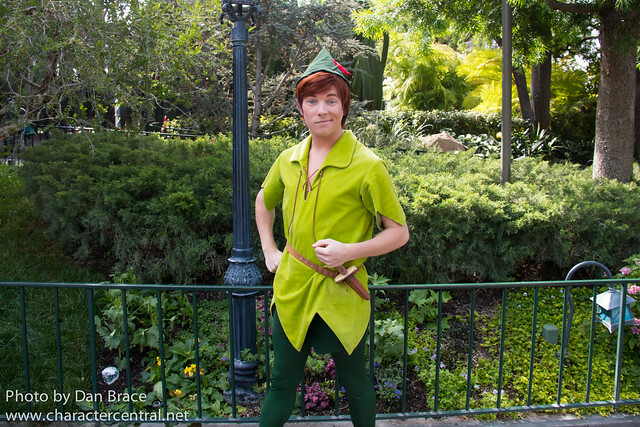 Ridley is best known for his Peter and the Starcatcher series and Kingdom Keepers series. 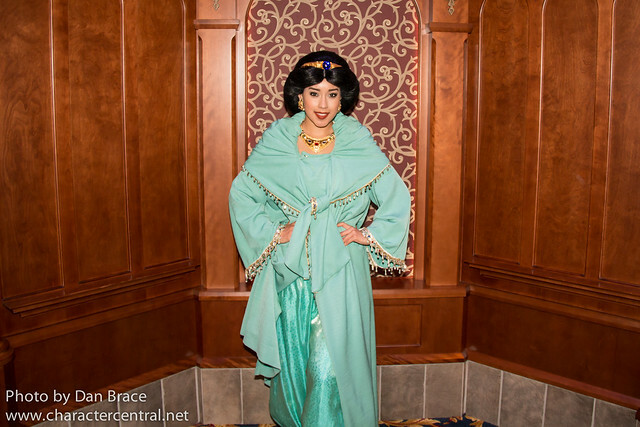 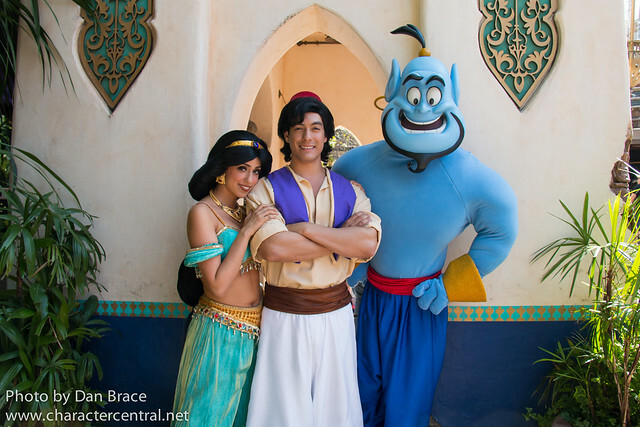 In Adventureland, Aladdin, Jasmine and Genie flew in on their magic carpet from Agrabah to greet us near the Oasis. 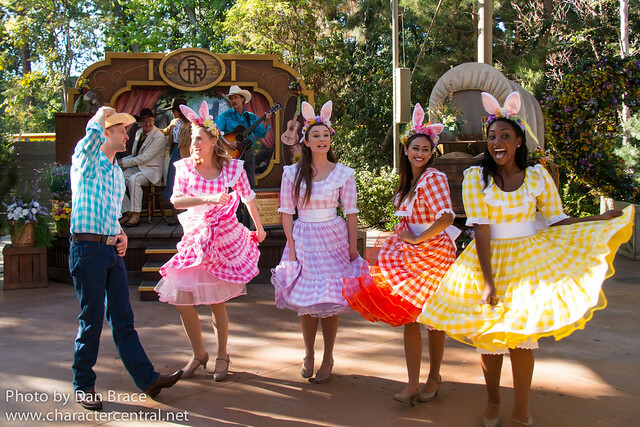 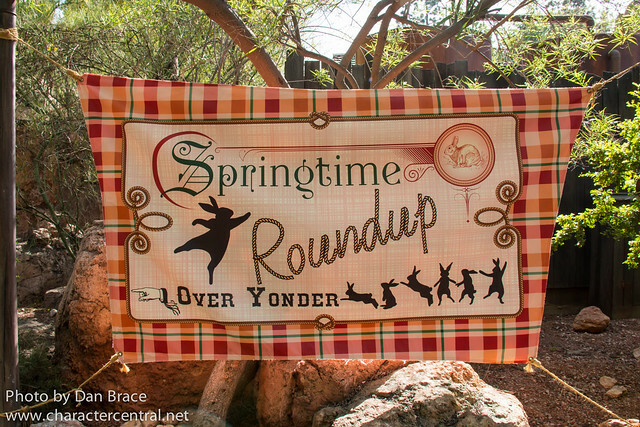 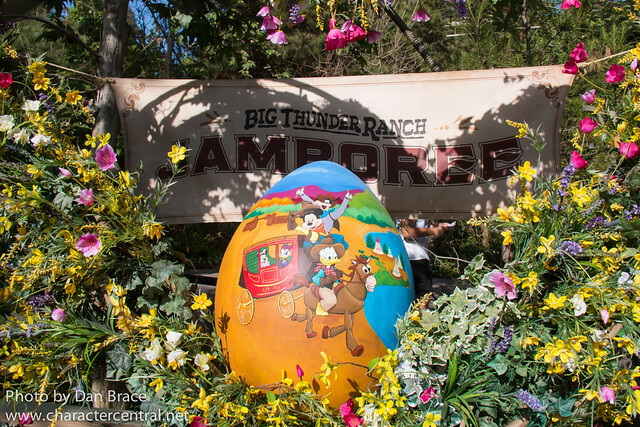 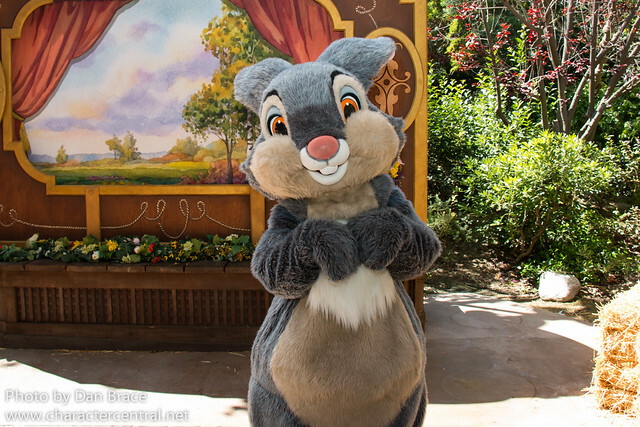 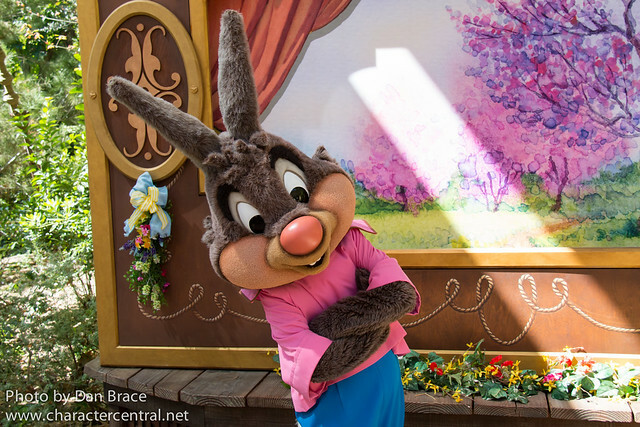 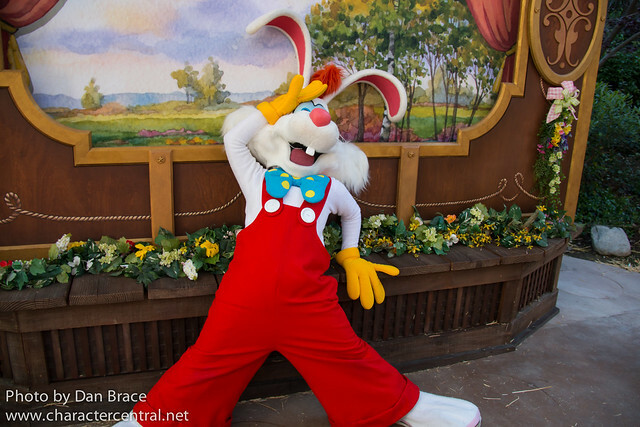 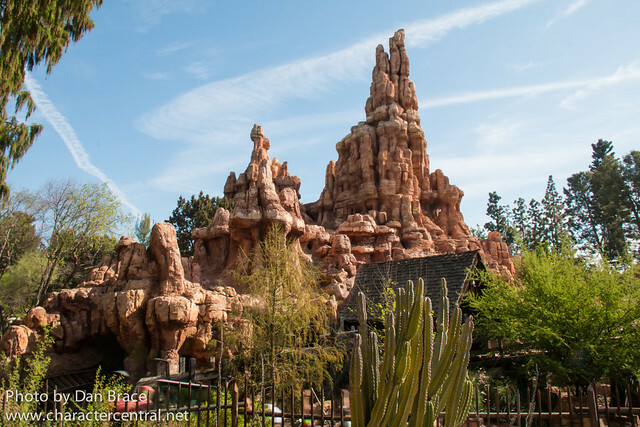 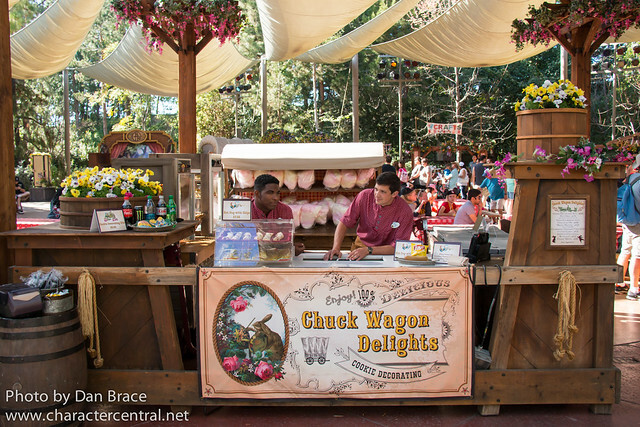 Over at the Big Thunder Ranch in Frontierland, Springtime Roundup was in full swing, and like all the seasonal events that Disneyland host there, it was a very colourful, very entertaining and of course, filled with characters! 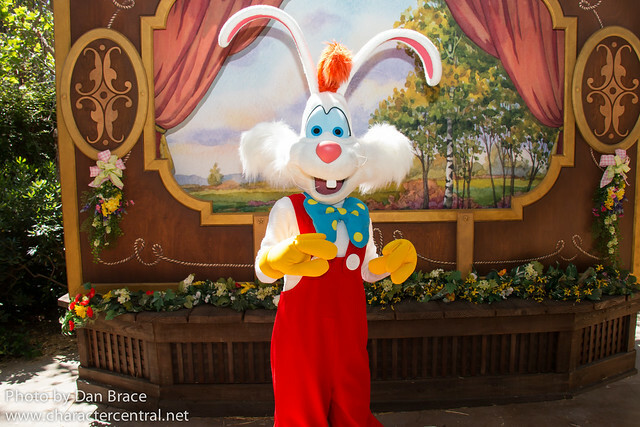 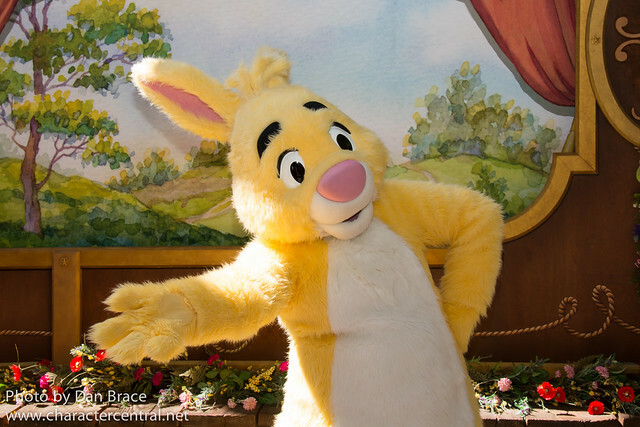 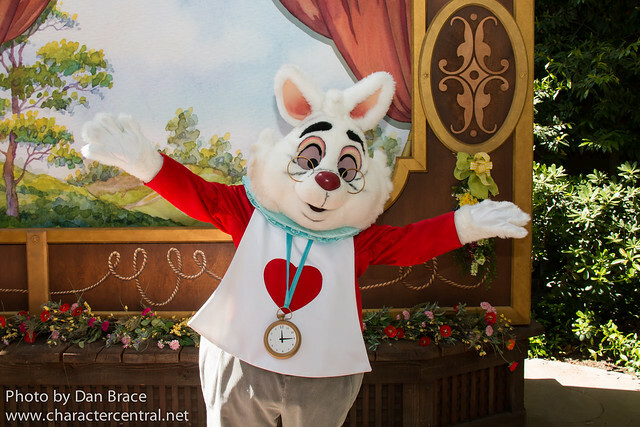 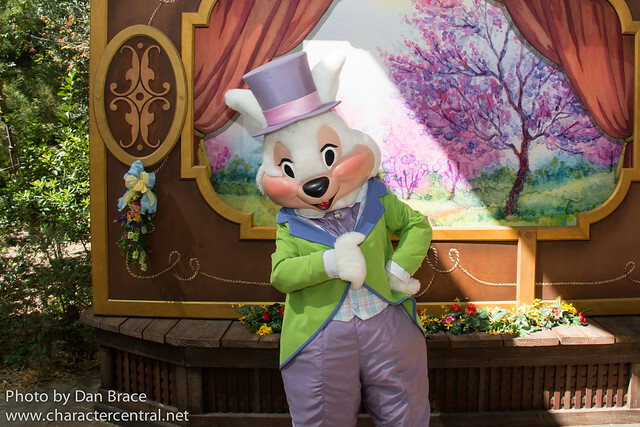 The characters have a distinct spring/bunny theme to them for spring, and up until Easter Sunday, Mr Easter Bunny was there too. 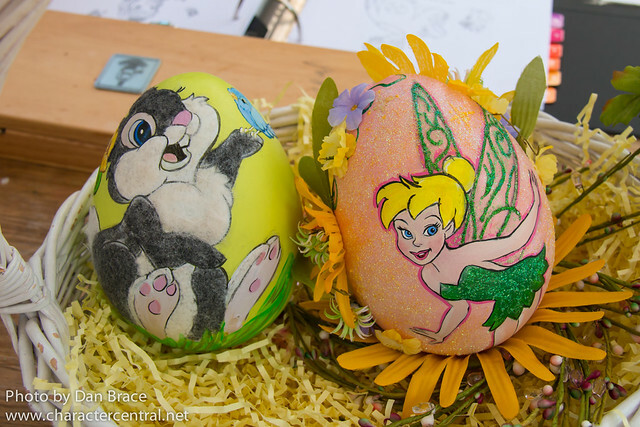 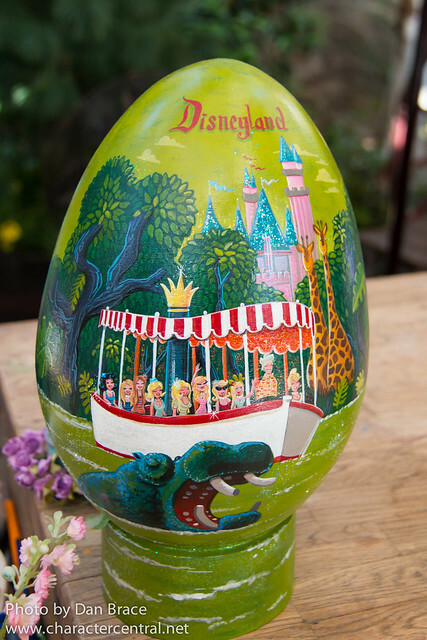 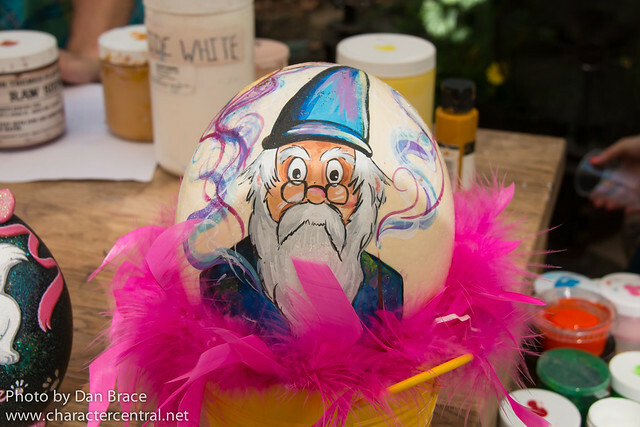 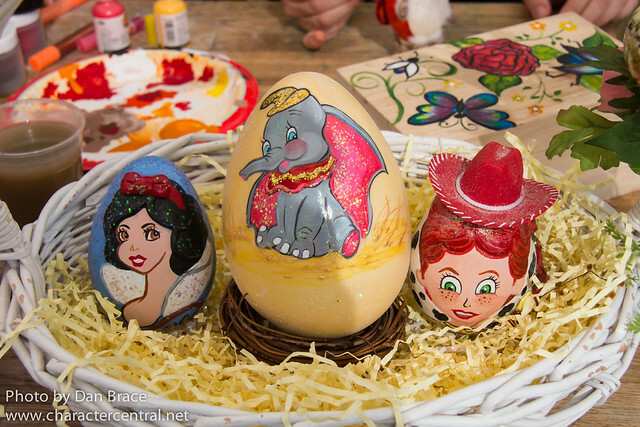 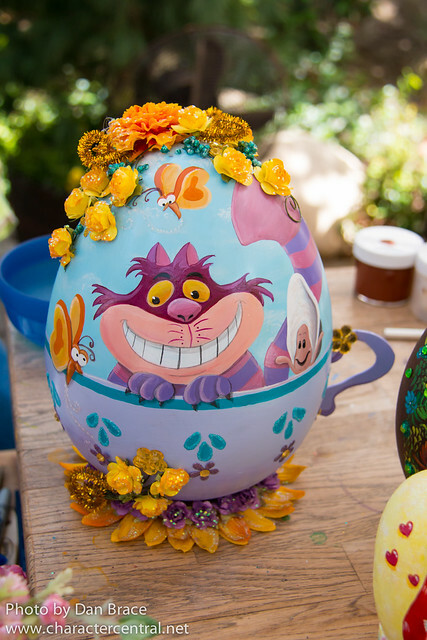 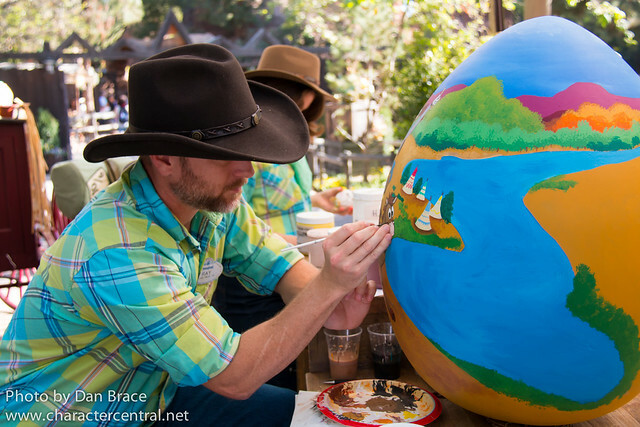 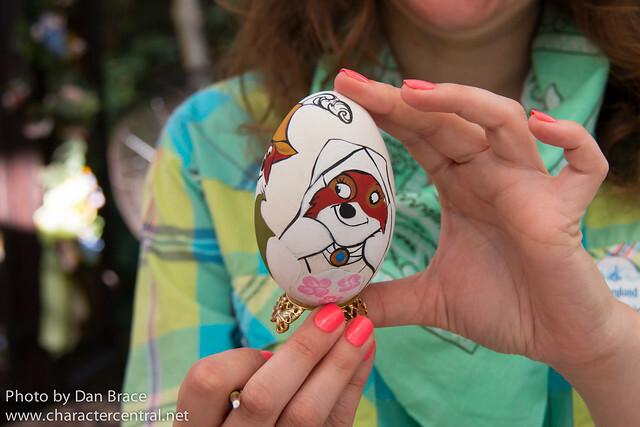 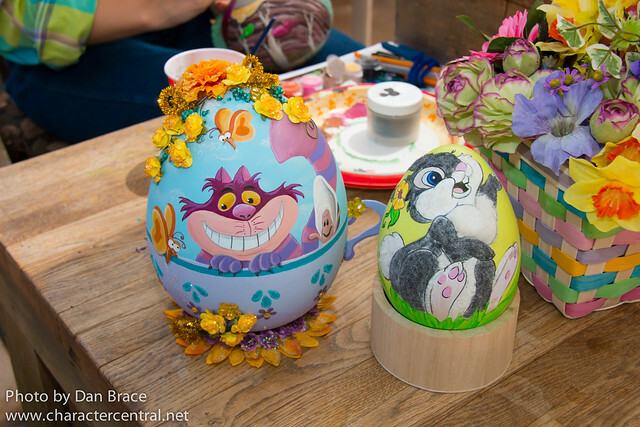 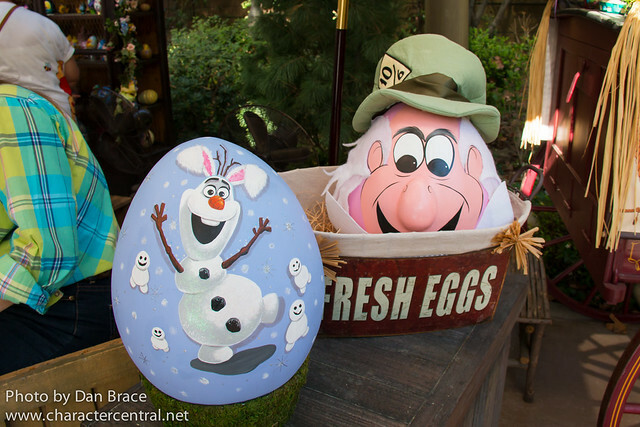 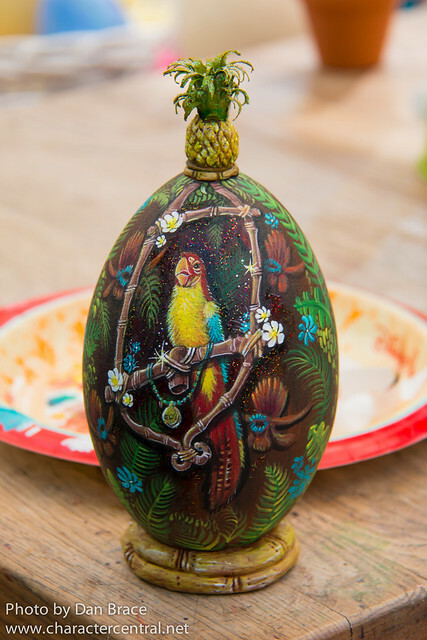 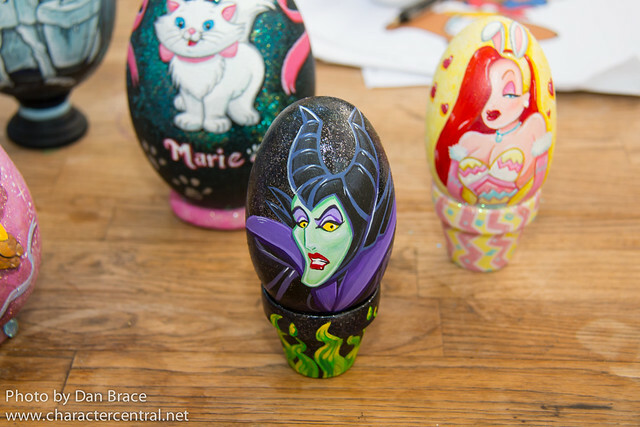 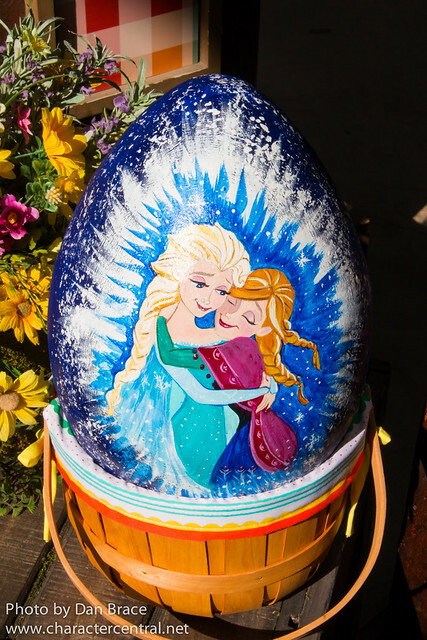 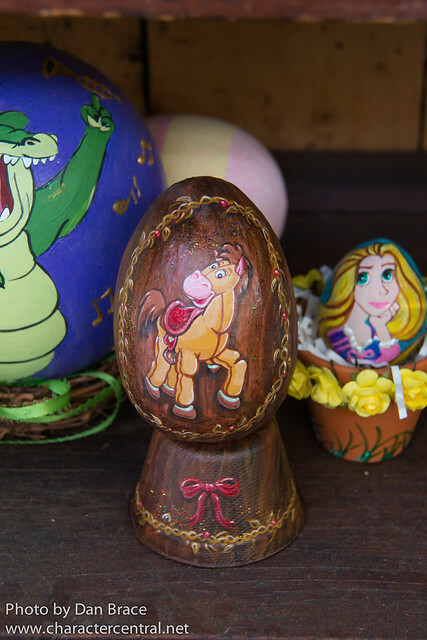 As well as the characters and live entertainment, incredibly skilled artisans were hard at work painting beautiful Disney themed Easter Eggs. 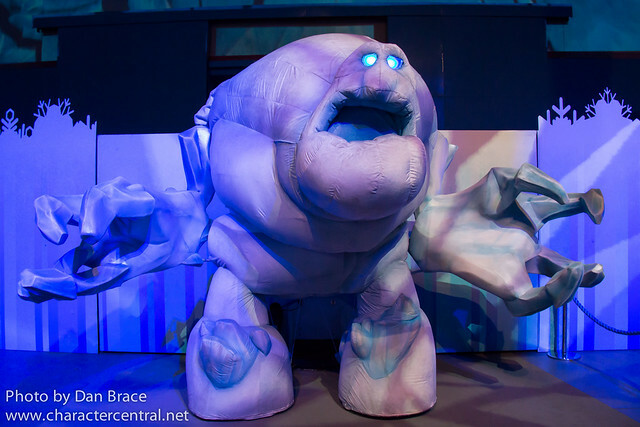 I cannot express enough how awesome all of their work is. 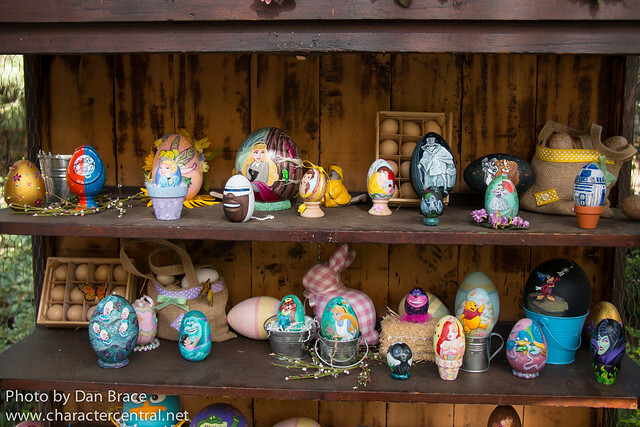 I tried to capture as many of the eggs as I could, but there were just so many, and they kept producing new ones daily while we were there! 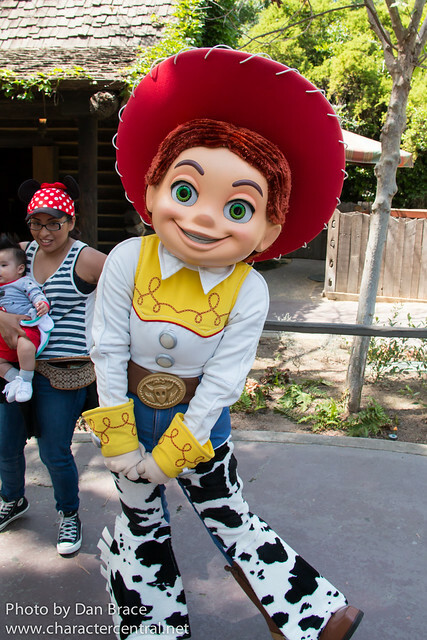 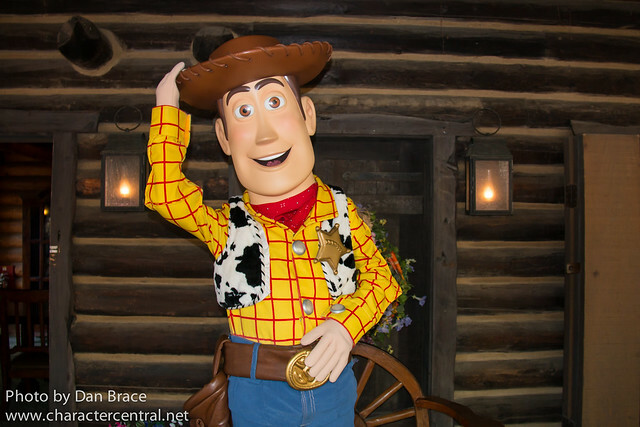 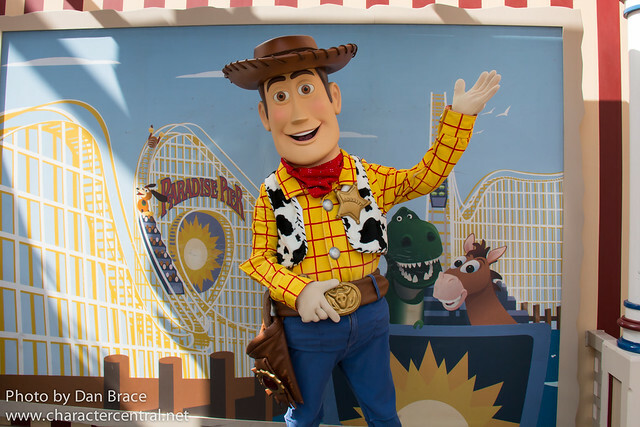 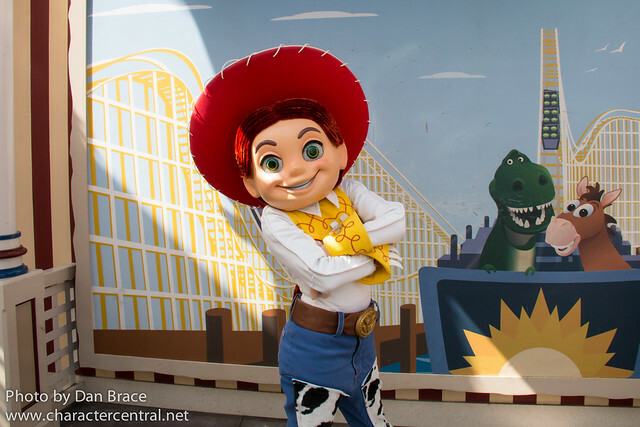 Woody and Jessie were near the Big Thunder Ranch Jamboree, but are not part of the Springtime Roundup. 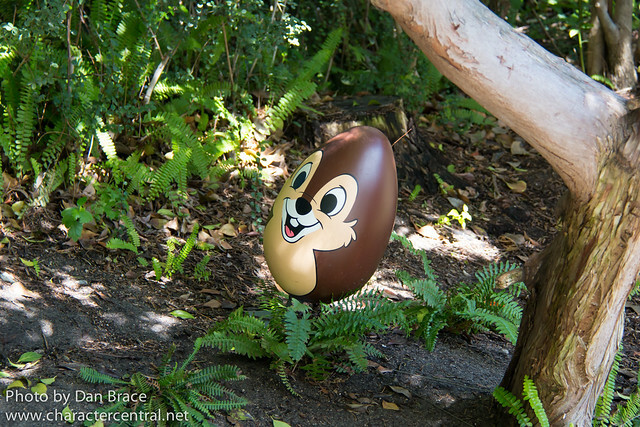 Frontierland is home to other, regular entertainment too, so we took the time to see Farley the Fiddler and The Laughing Stock Co.
We also took part in the Easter Egg Hunt, and managed to find all the hidden character eggs, some of which I'll share below (I won't tell their exact locations though!). 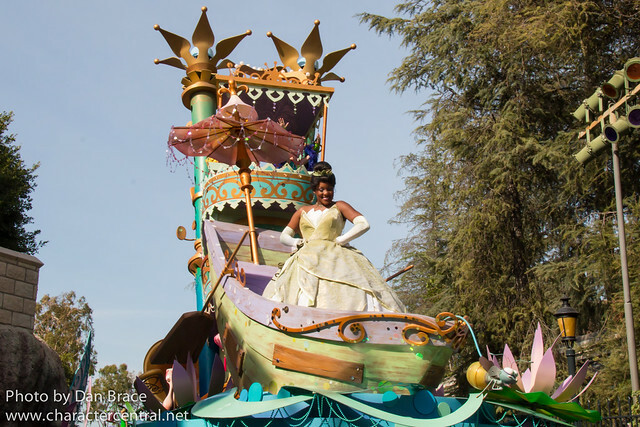 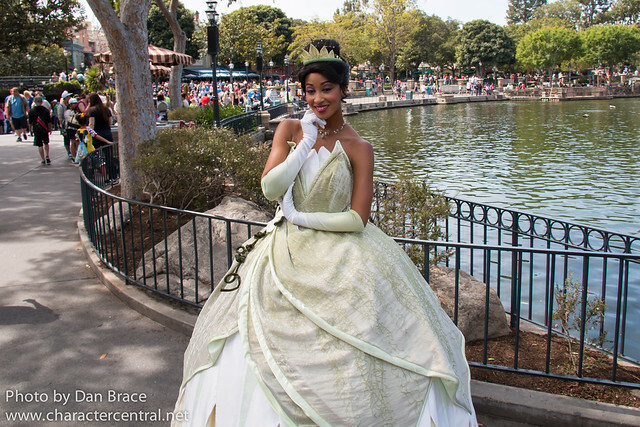 In New Orleans Square we met Princess Tiana and watched the Royal Street Bachelors, the Bootstrappers and Jambalaya Jazz. 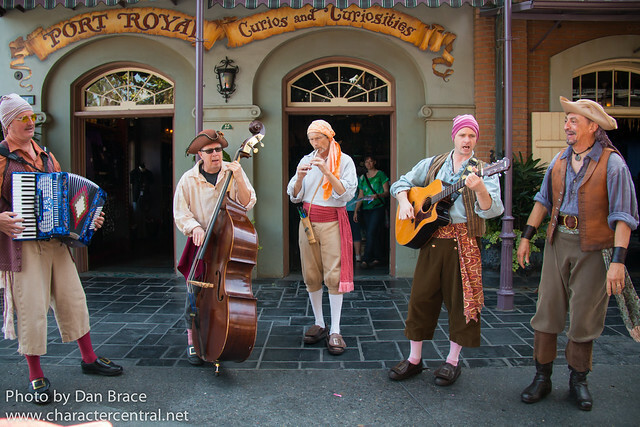 I don't have my photos of the Royal Street Bachelors edited, so they won't be pictured below. 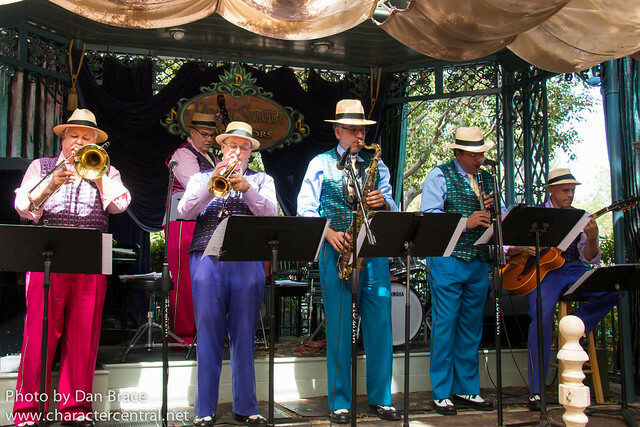 We ate at Cafe Orleans twice during our trip. 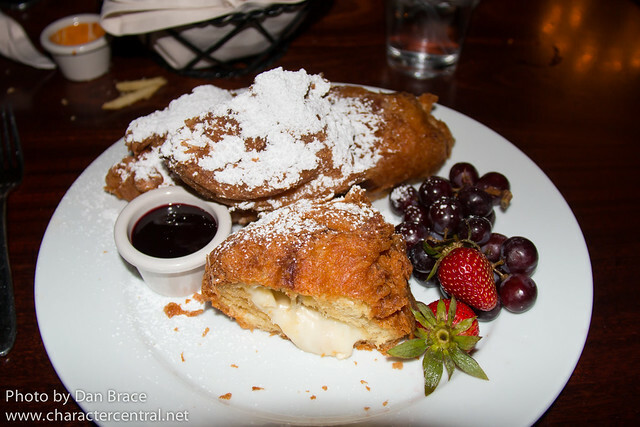 If you have never eaten there before, you must have the three cheese Monte Cristo sandwish. 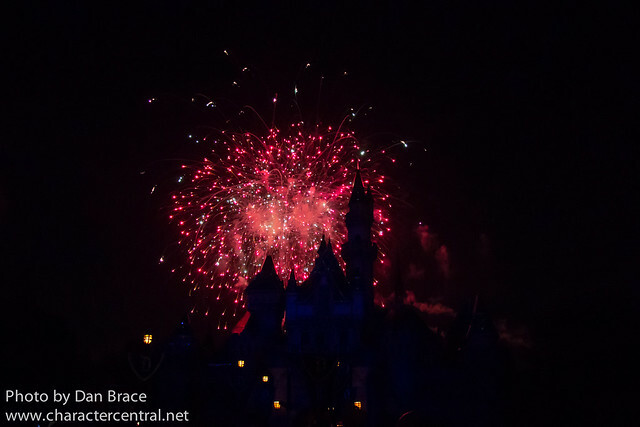 Words and pictures cannot even describe how amazing it is! 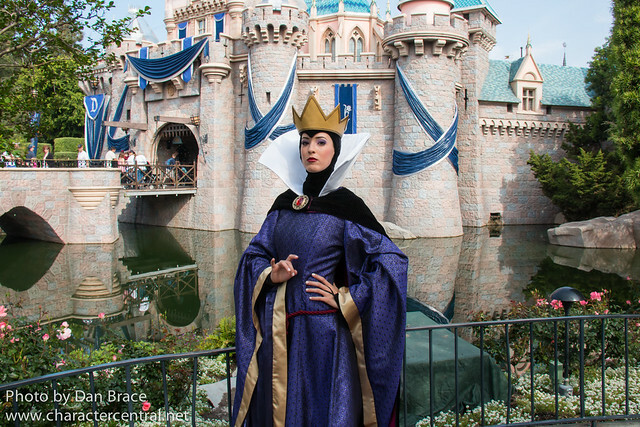 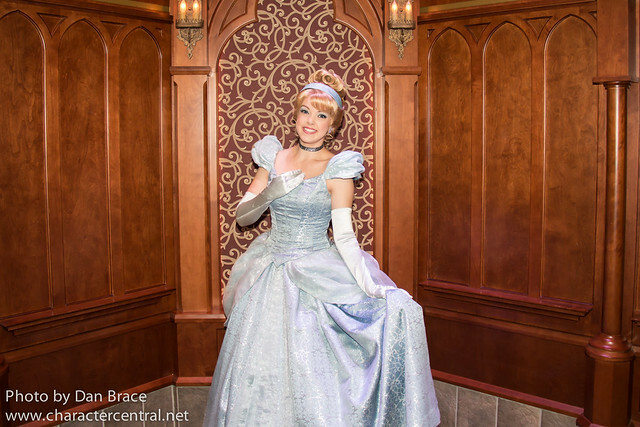 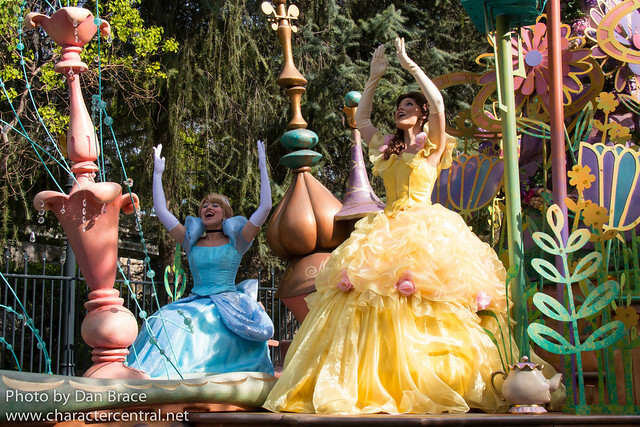 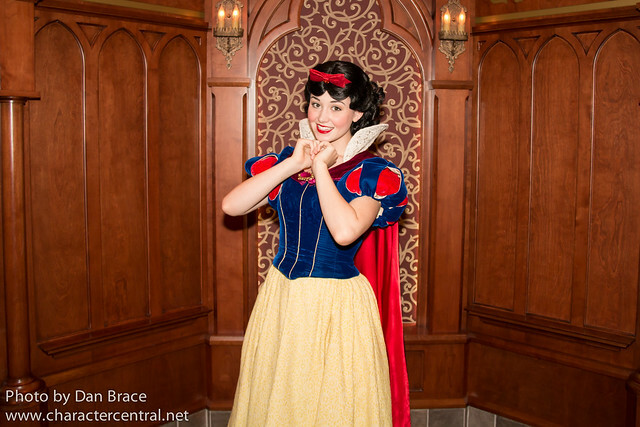 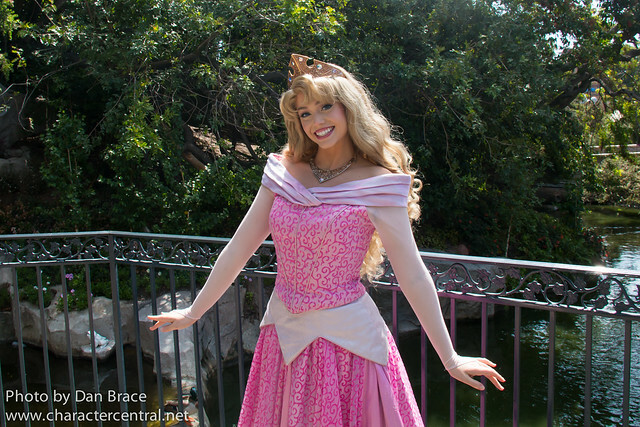 At Snow White's Grotto near Sleeping Beauty Castle, we met the Queen and Princess Aurora. 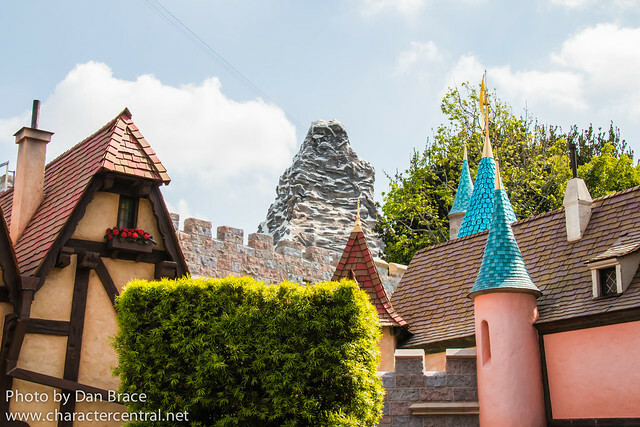 Near the Matterhorn Peter Pan was flying around, and Captain Hook was hiding out near Dumbo the Flying Elephant. 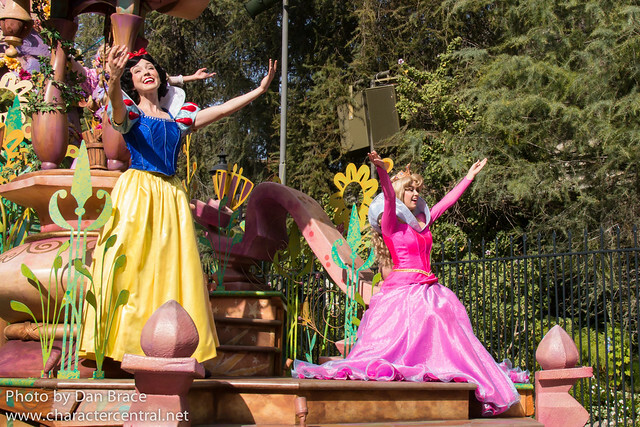 At Royal Hall Jasmine, Snow White, Cinderella and Belle were greeting loyal subjects. 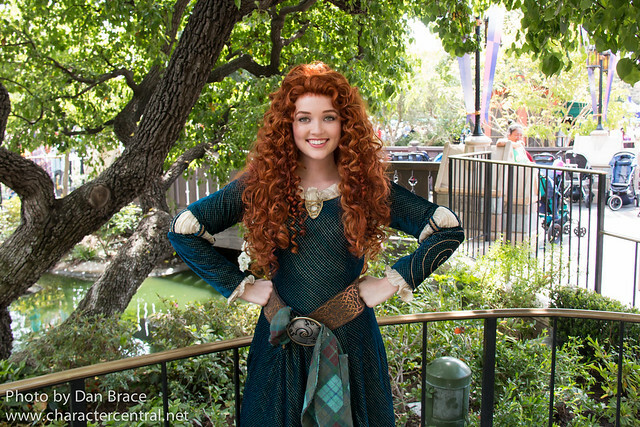 Outside the Royal Hall, Merida and Rapunzel were greeting, but we only got to meet Merida. 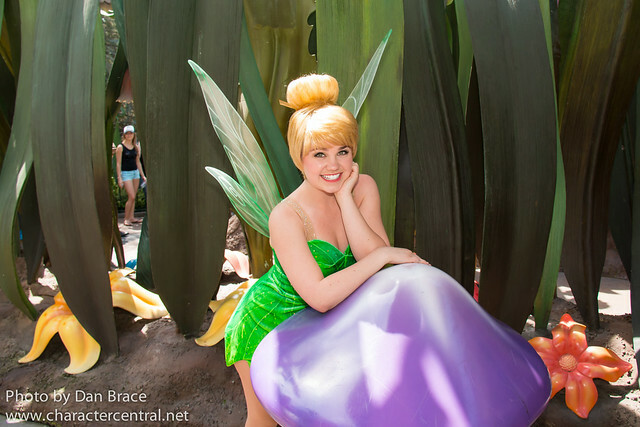 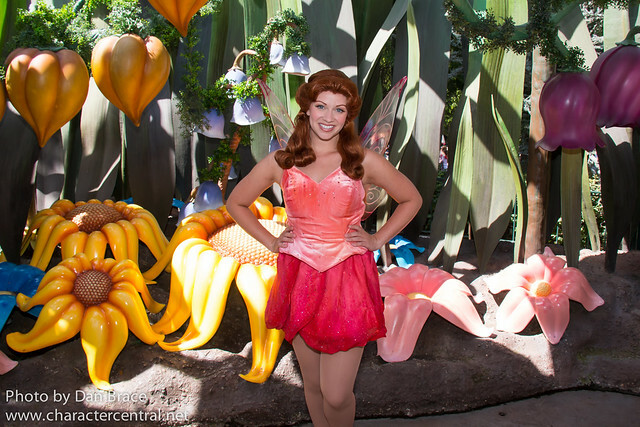 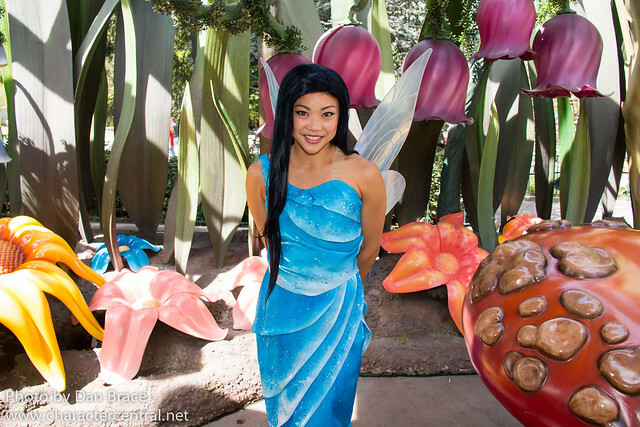 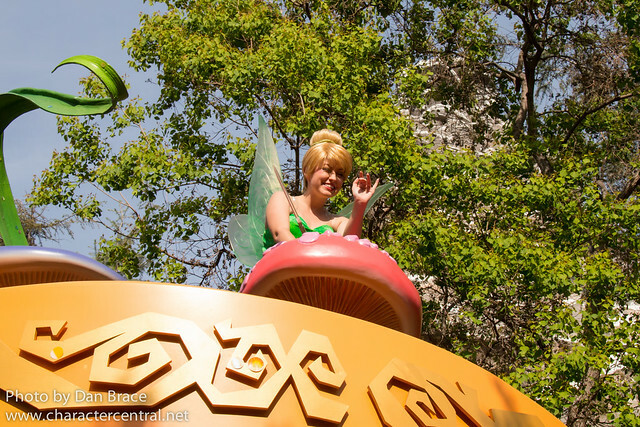 At Pixie Hollow, Tinker Bell, Silvermist and Rosetta had flown in from Neverland. 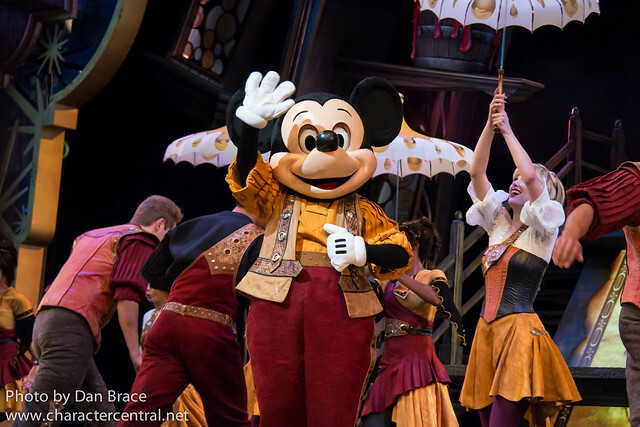 Fantasyland is home to two shows at present; Mickey and the Magical Map and the Frozen storytelling. We watched both on this trip. 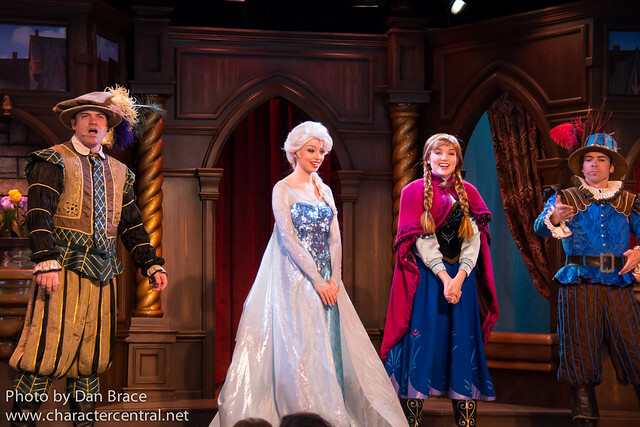 The Frozen one is relatively new, and although I enjoyed it, I think I prefer both the original Beauty and the Beast and Tangled shows. 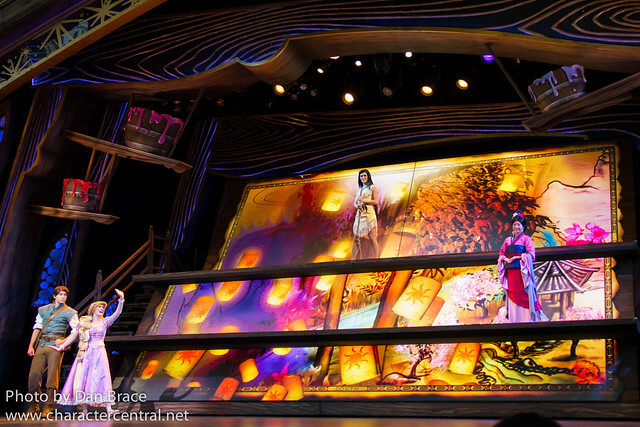 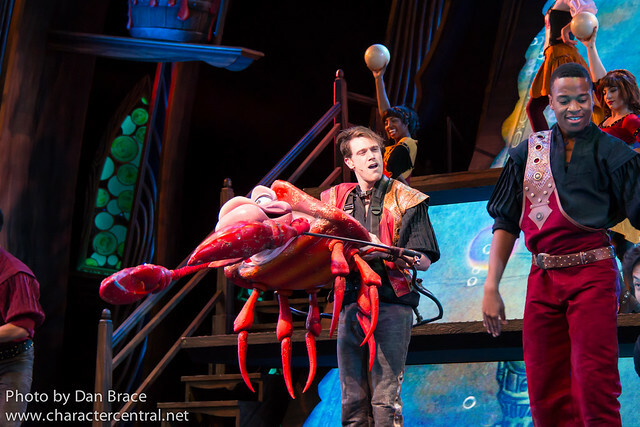 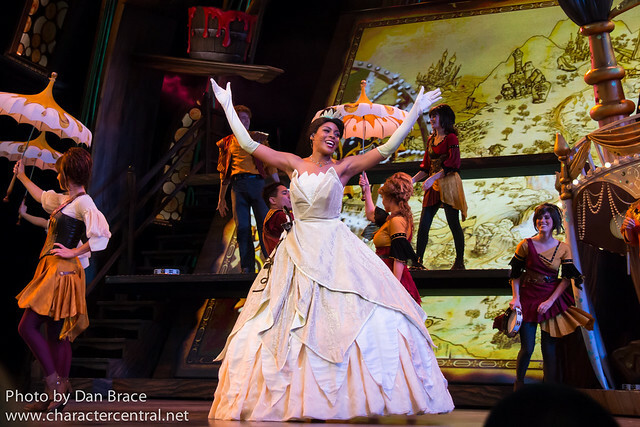 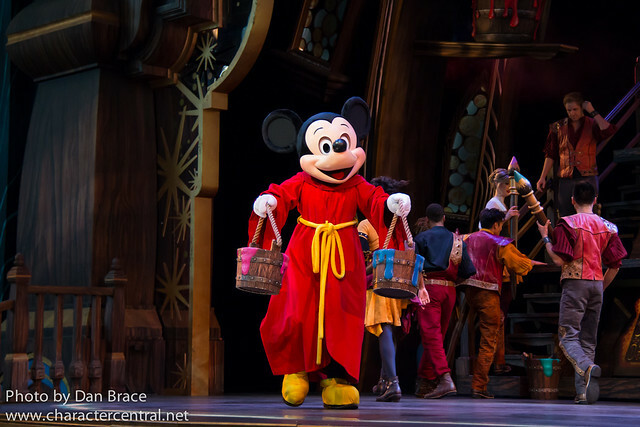 Mickey and the Magical Map is not a show we usually watch because of the time is takes up, and it's not one our favourites, but seeing as we had nine days in the park, we managed to fit it in. 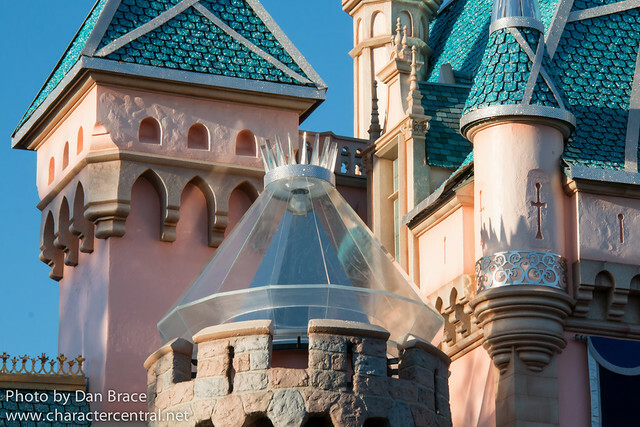 Sleeping Beauty Castle was getting ready for its 60th anniversary coming up very soon, and we got to see a work-in-progress of the decorations being installed for the big day. 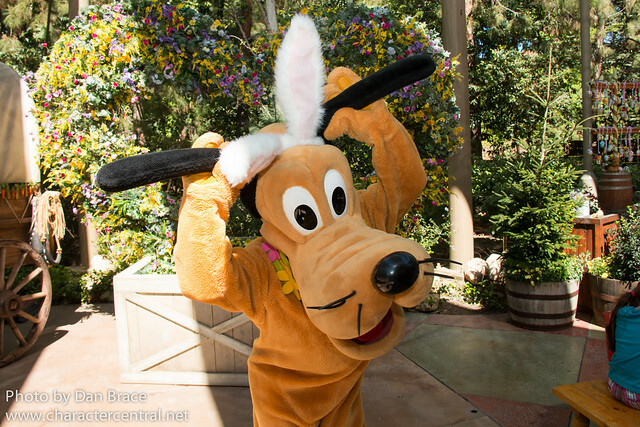 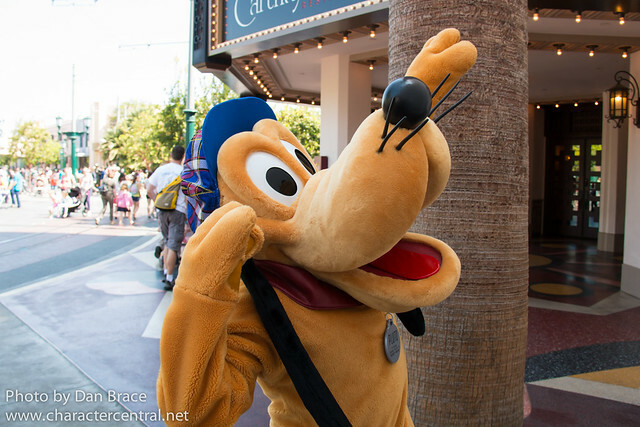 In Toontown we met Pluto, Goofy, Minnie Mouse and Mickey Mouse. 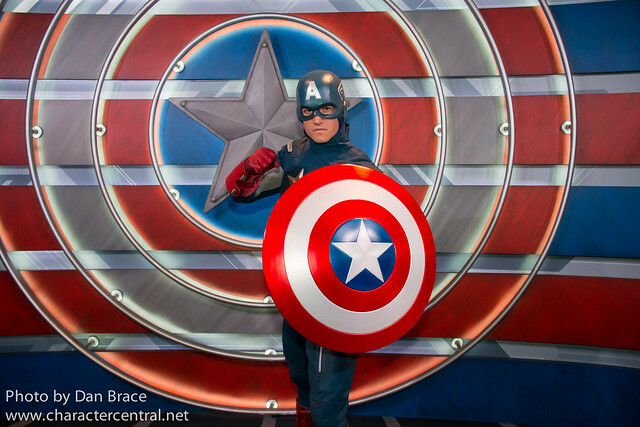 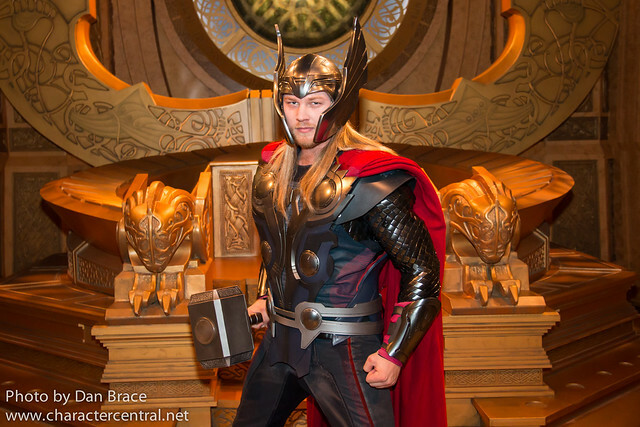 In Tomorrowland we met Captain America and Thor days before their location closed (Innoventions is supposedly being transformed into something new). 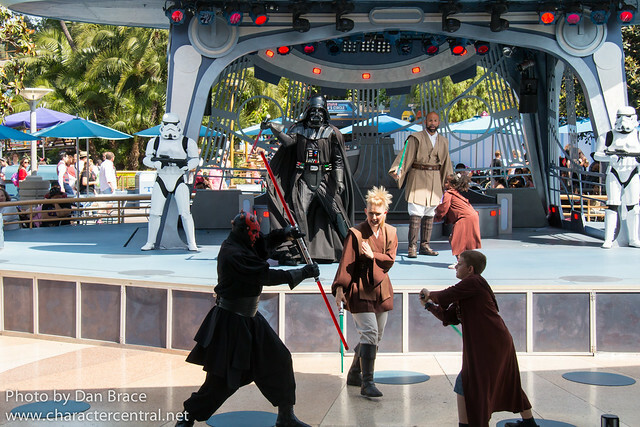 We also watched the Jedi Training Academy. 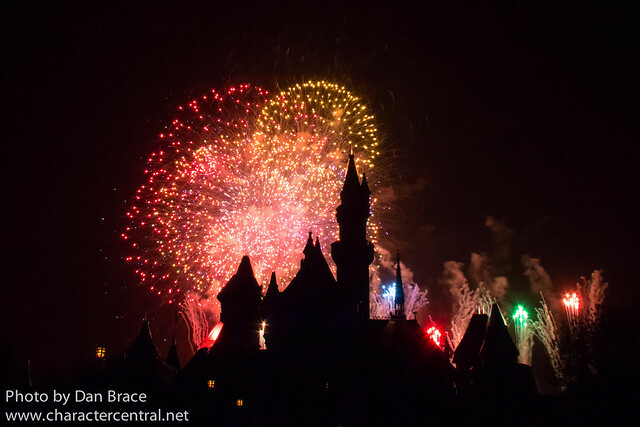 Finally for Disneyland park, we watched Mickey's Soundsational parade (including the Frozen pre-parade) and the Fantasy in the Sky Fireworks. 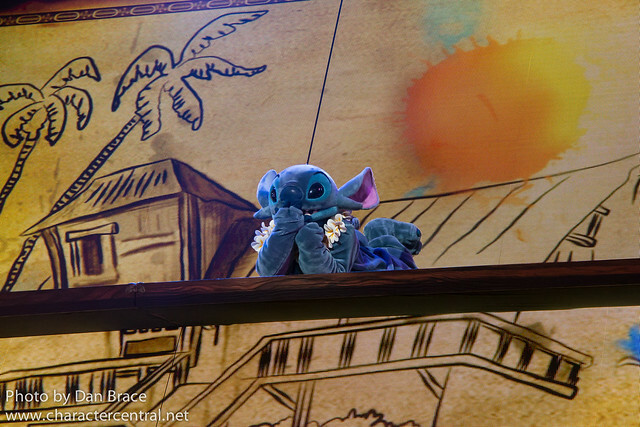 We didn't watch Fantasmic! 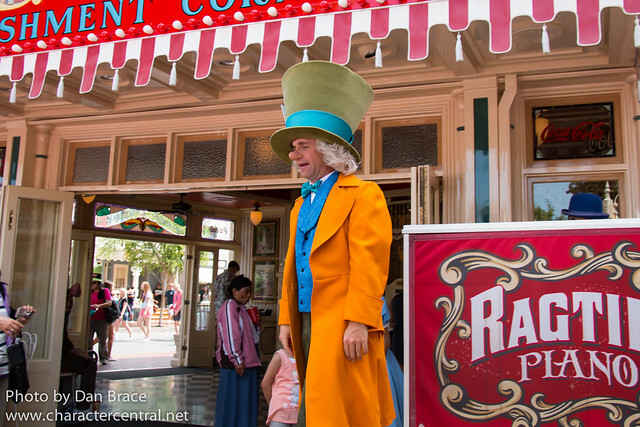 this trip, as to be honest, it's a nightmare to try to watch. 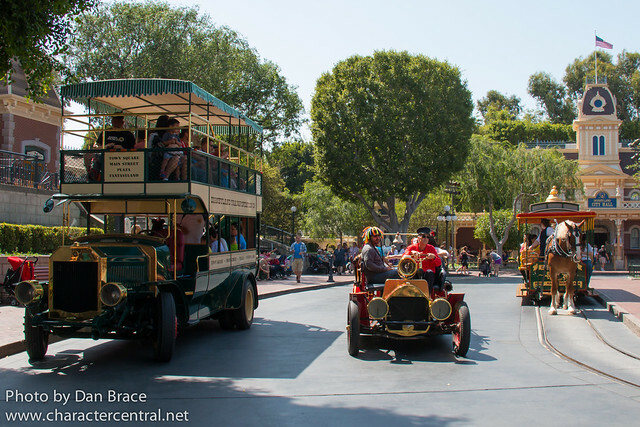 The crowds, the FastPass system and the less than ideal viewing areas unfortunately make for a less than leisurely experience. 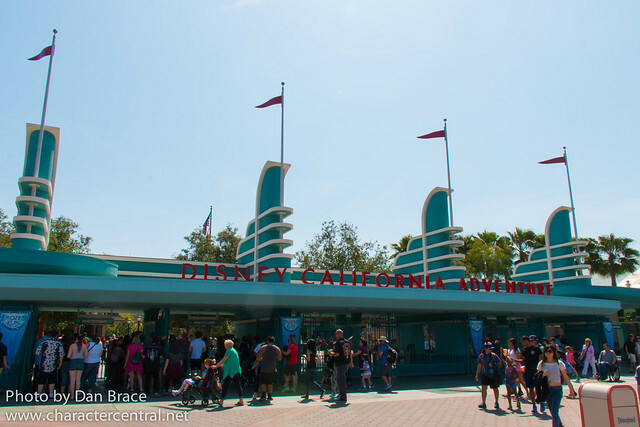 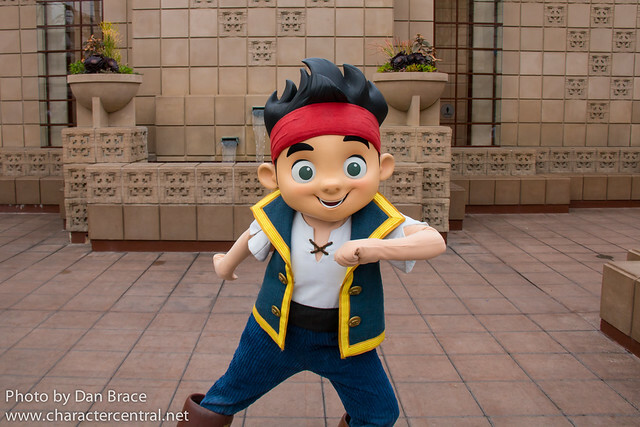 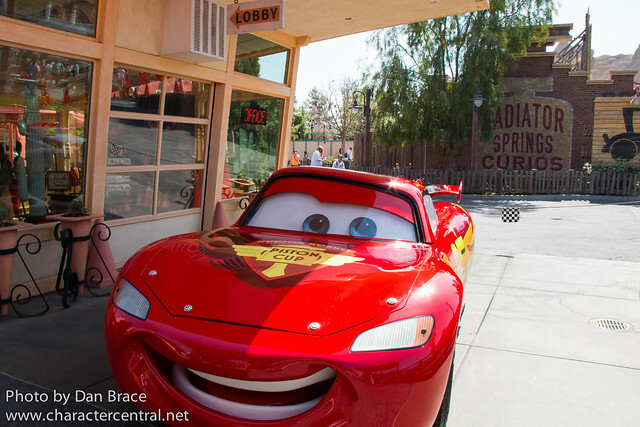 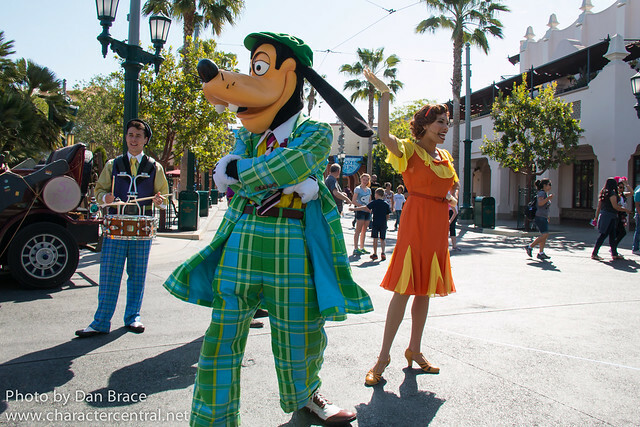 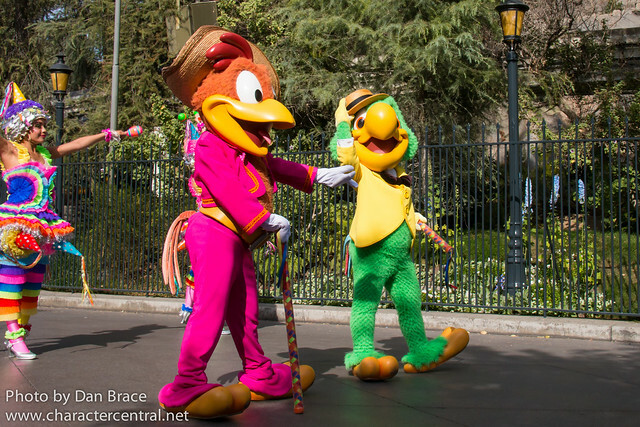 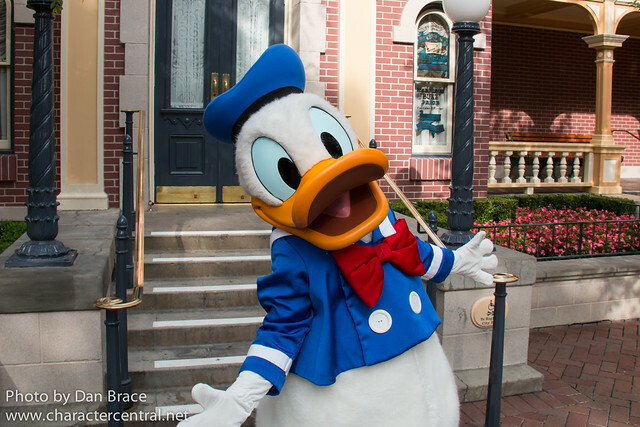 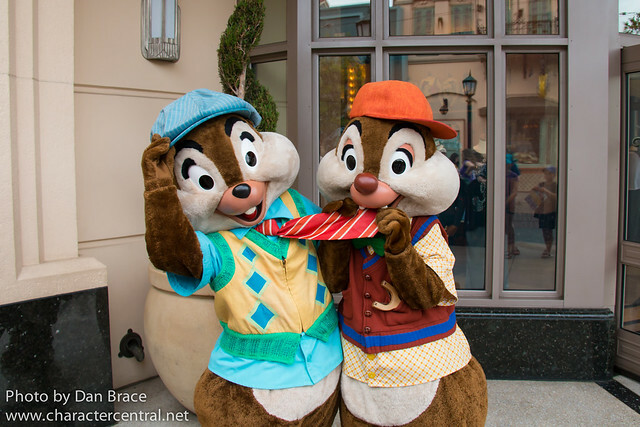 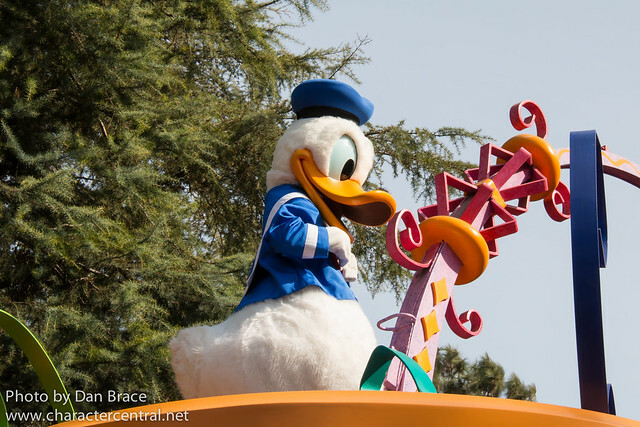 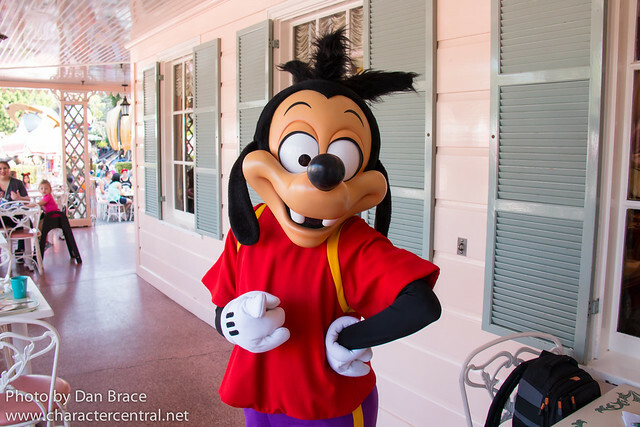 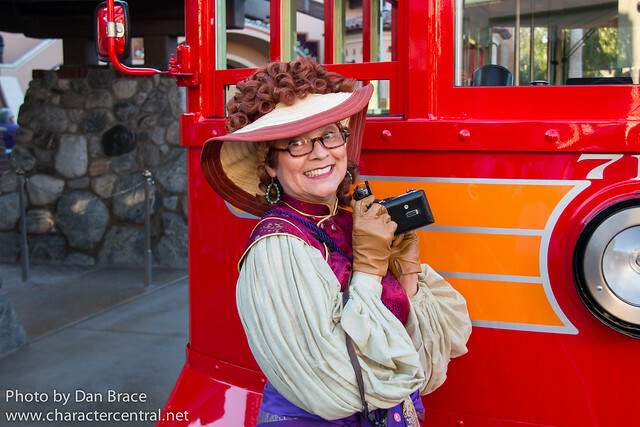 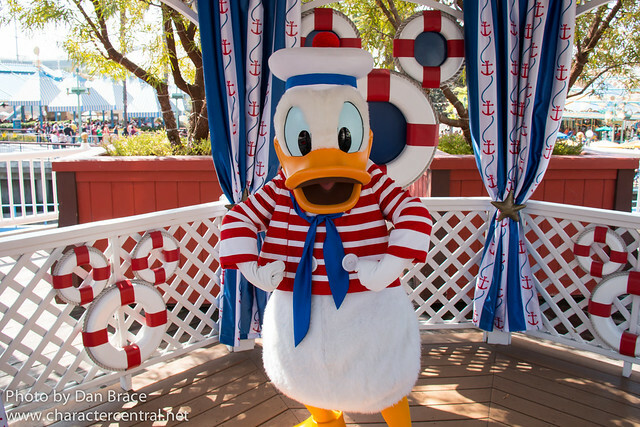 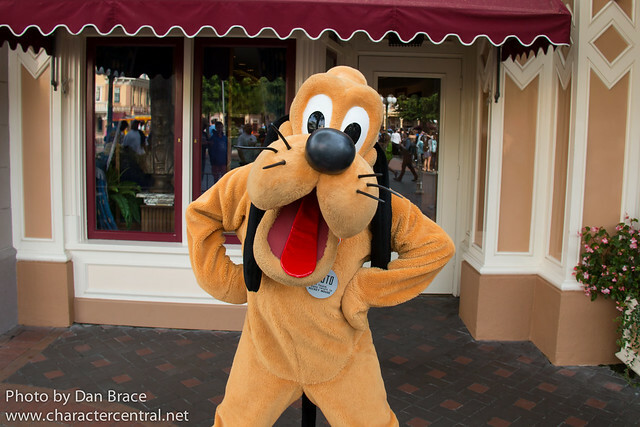 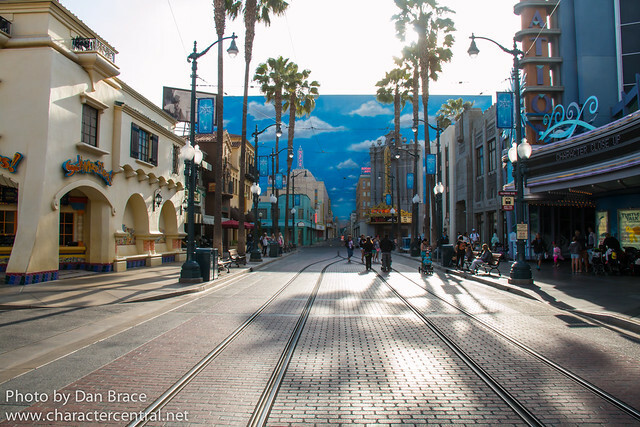 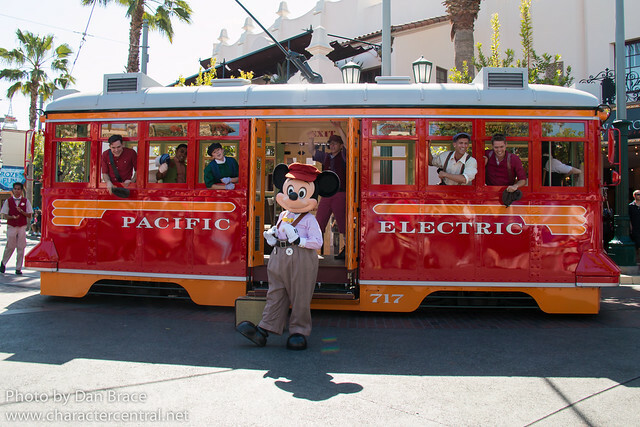 Now let's cross the Esplanade and see what adventures we had at Disney California Adventure. 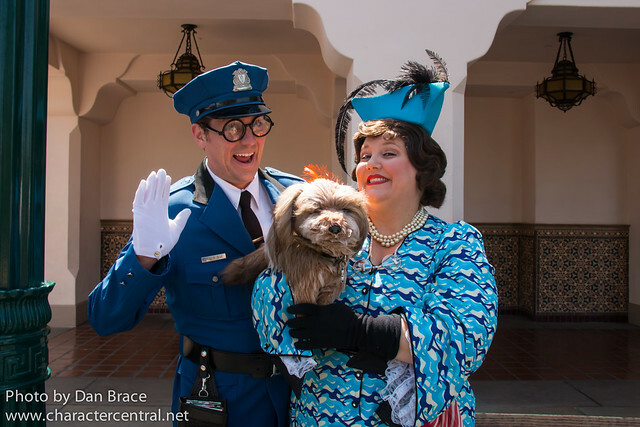 On Buena Vista Street we met Mickey Mouse, Chip 'n' Dale, Goofy, Pluto, Oswald the Lucky Rabbit, Phi Phi Francis, Officer Calvin Blue, Molly the Messenger and Donna the Dog Lady. 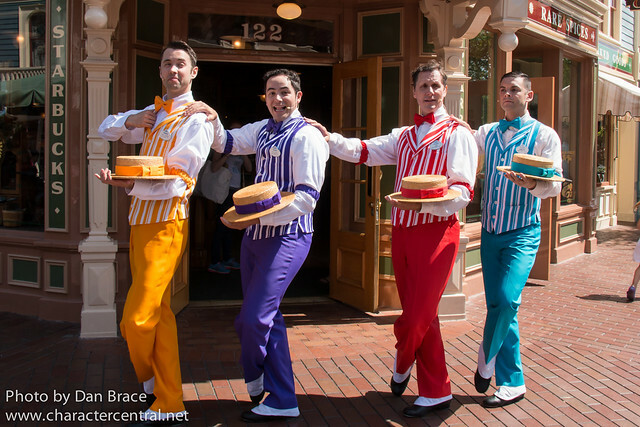 We watched the Five and Dime show and the Red Car News Boys. 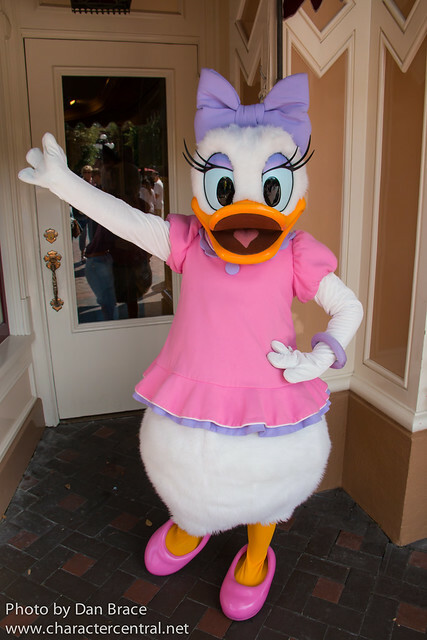 For some reason I don't know what happened to my photos of Molly the Messenger, so I can't share her below. 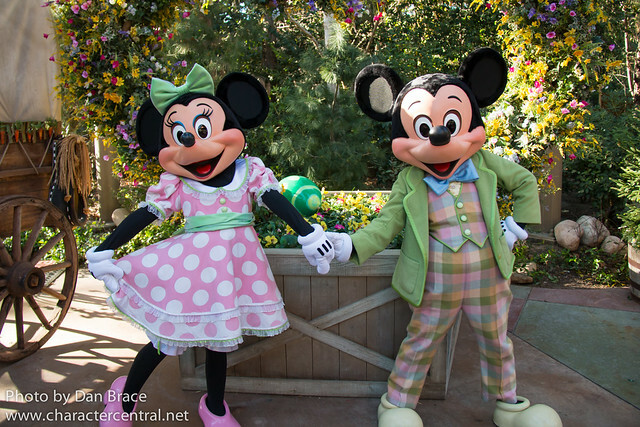 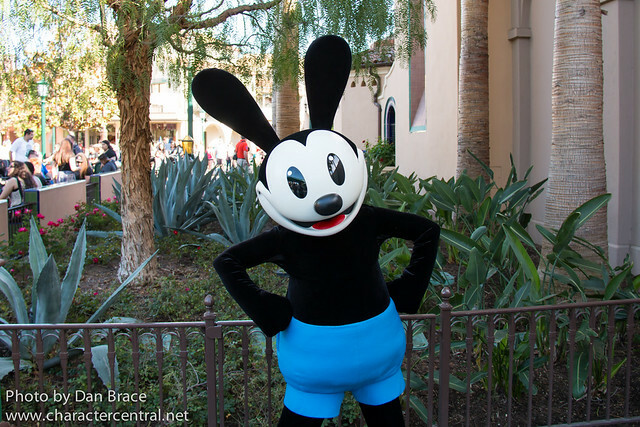 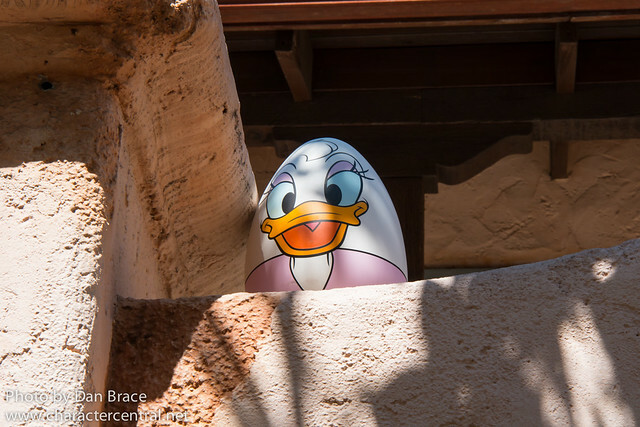 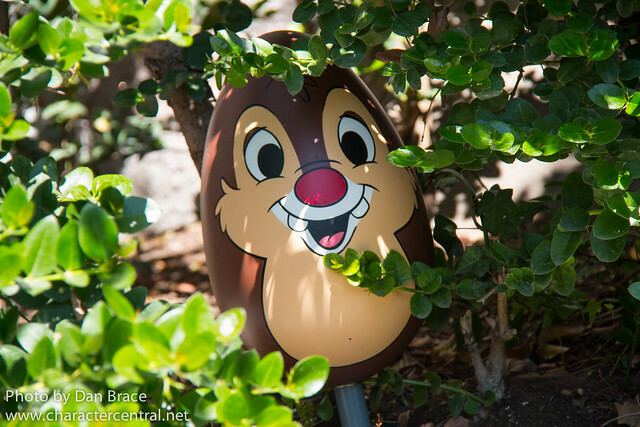 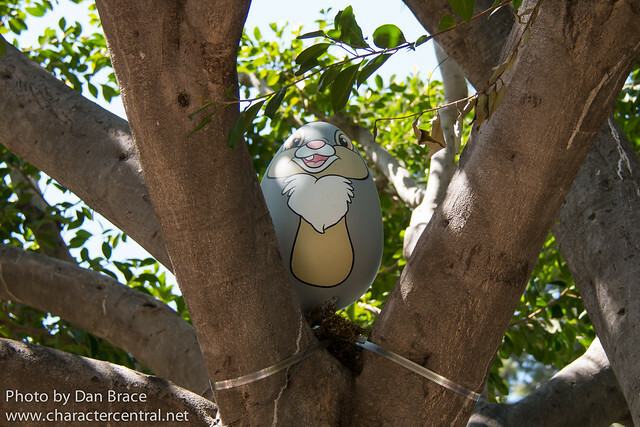 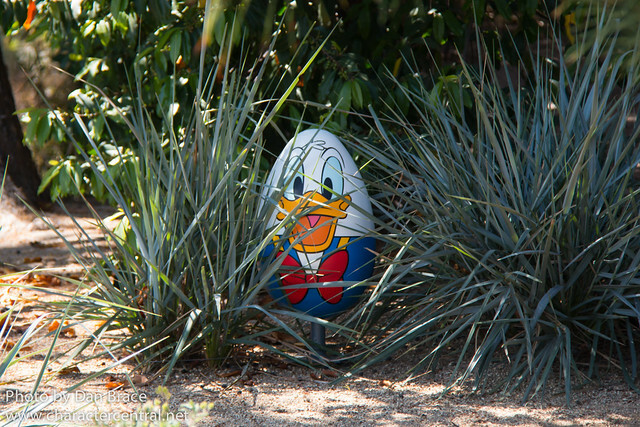 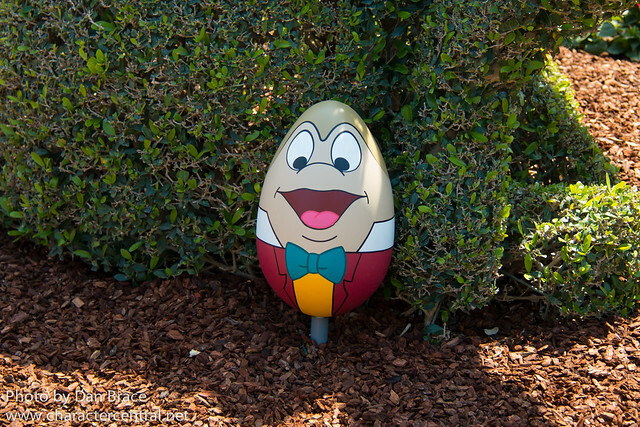 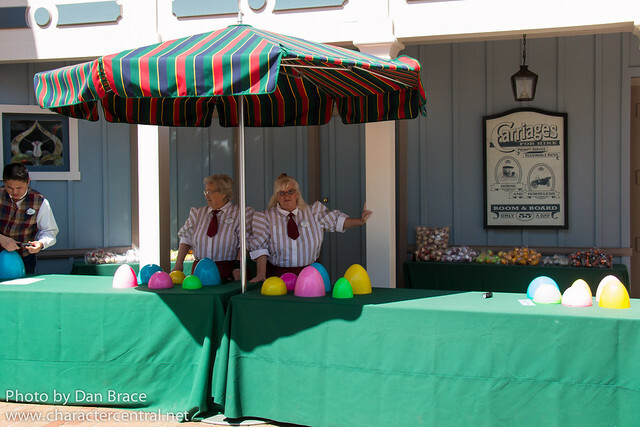 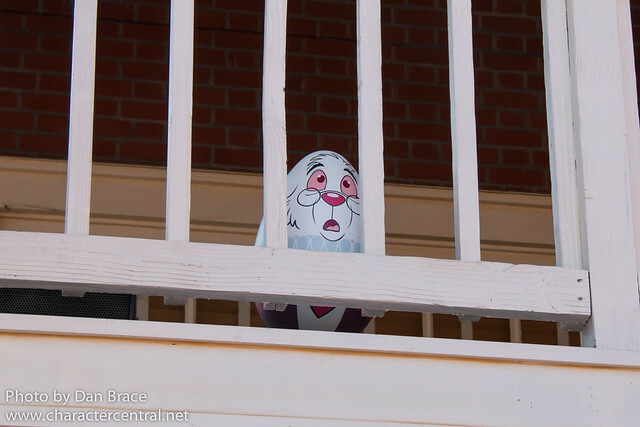 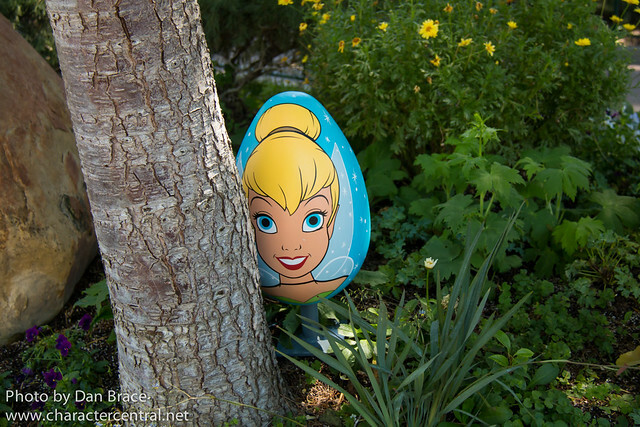 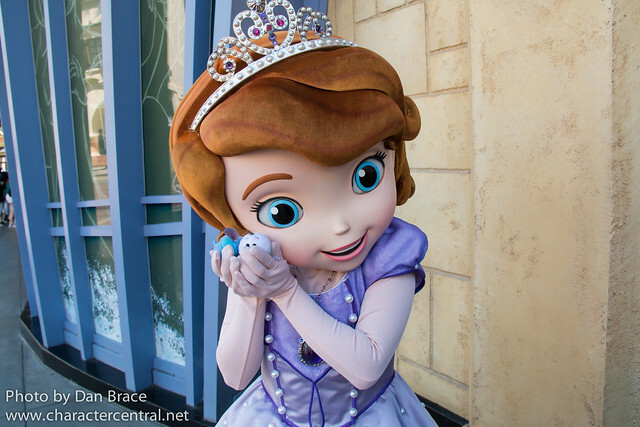 Just like at Disneyland, California Adventure had an Easter Egg hunt, which we of course took part in. 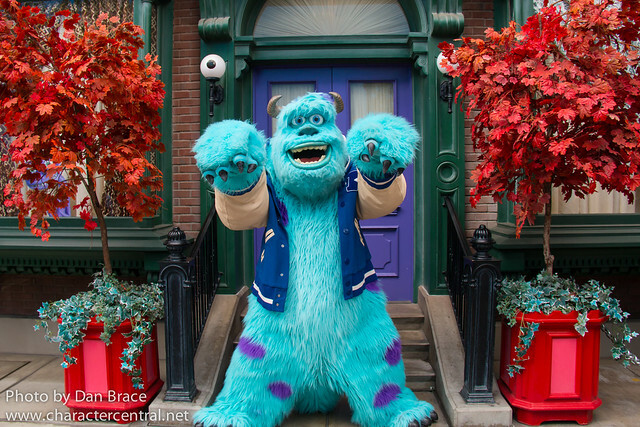 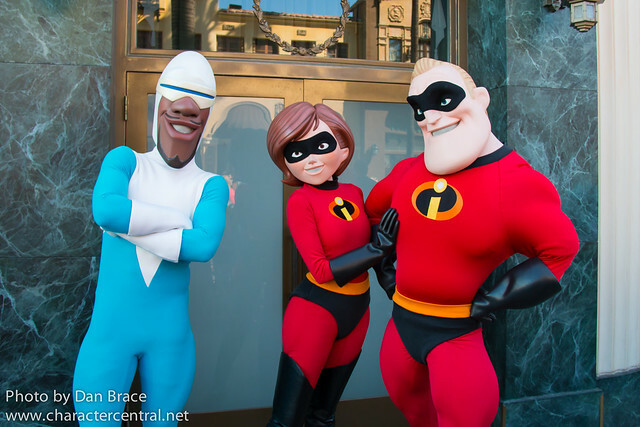 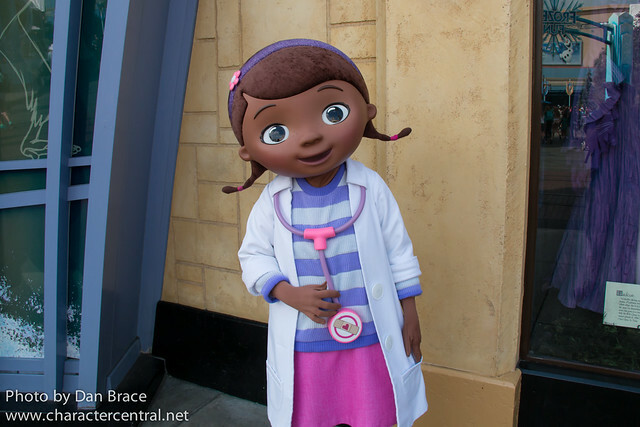 In Hollywood Land we met Jake, Princess Sofia, Doc McStuffins, Stitch, Sulley and the Incredibles. 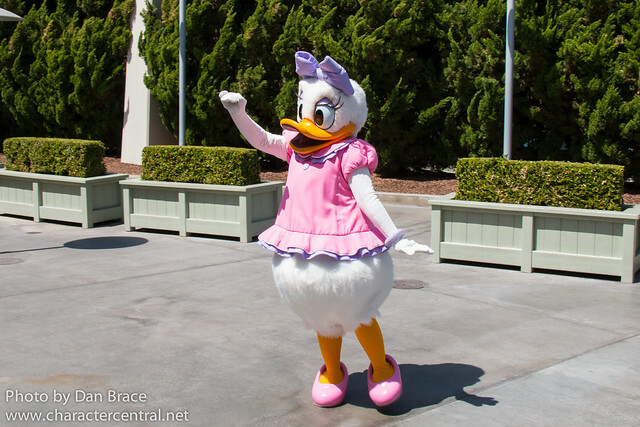 We also saw Daisy Duck out, but didn't get to meet her there. 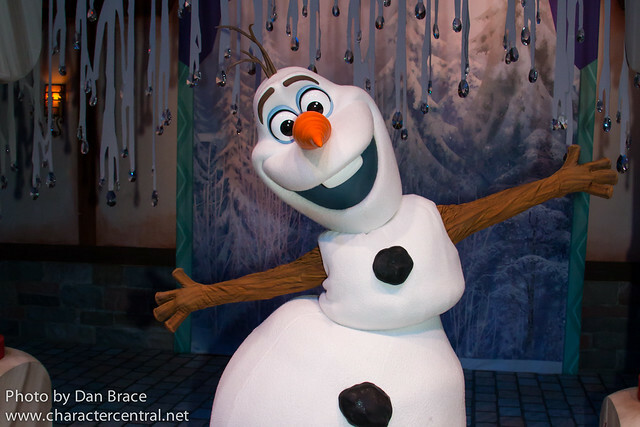 At Olaf's Snow Fest we of course met Olaf, and inside the Animation building we visited Anna and Elsa. 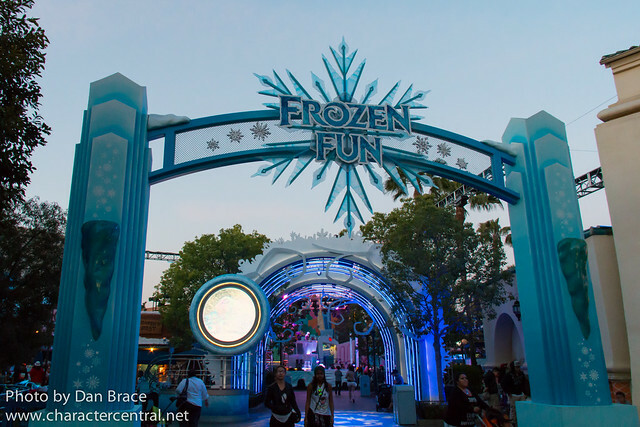 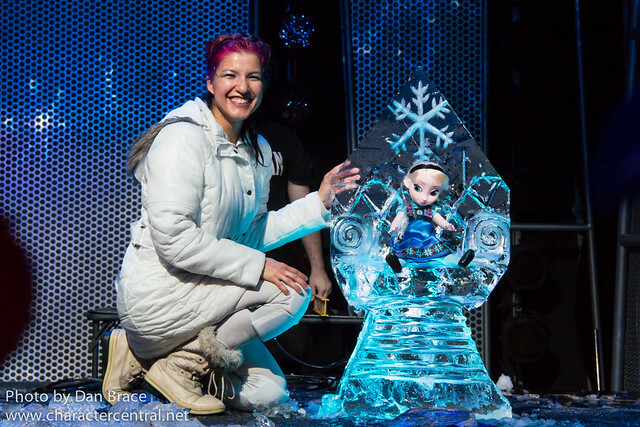 At night, Freeze the Night takes over Hollywood Land, and so we stayed to watch some of the main show, watch the ice carver and of course take photos. 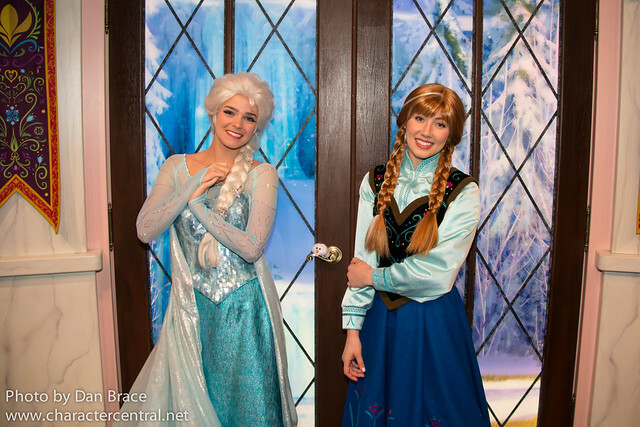 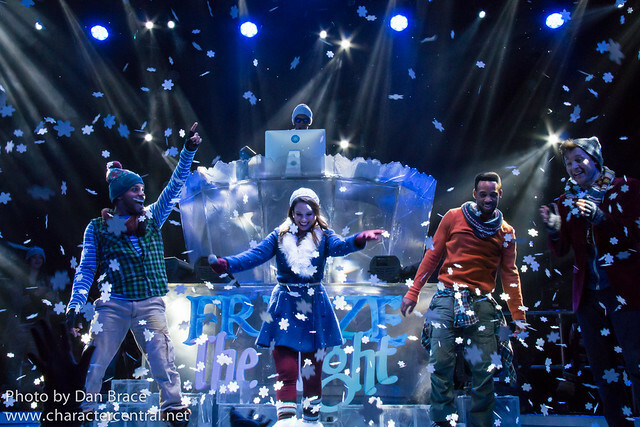 We did watch the Frozen sing-along, but I don't have photos this time as I decided to video it instead. 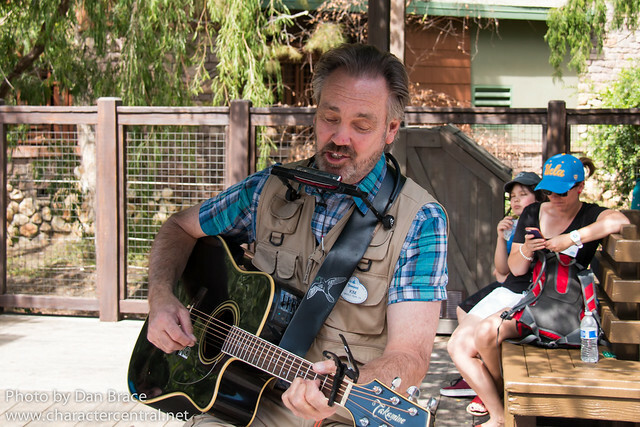 Jon has photos, but he hasn't got around to editing them yet. 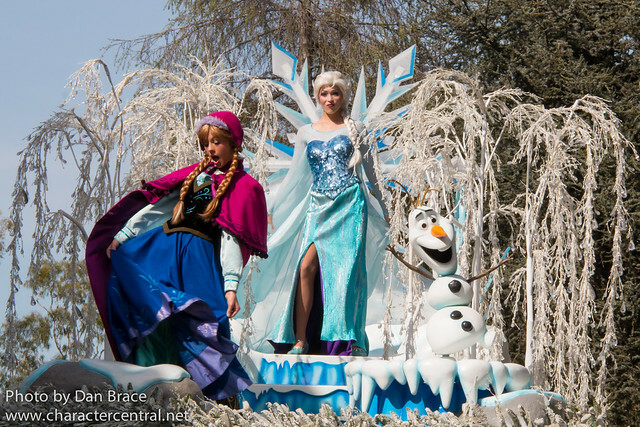 Inside Olaf's Snow Fest there are two entertainment troupes that perform throughout the day, so we watched both of them. 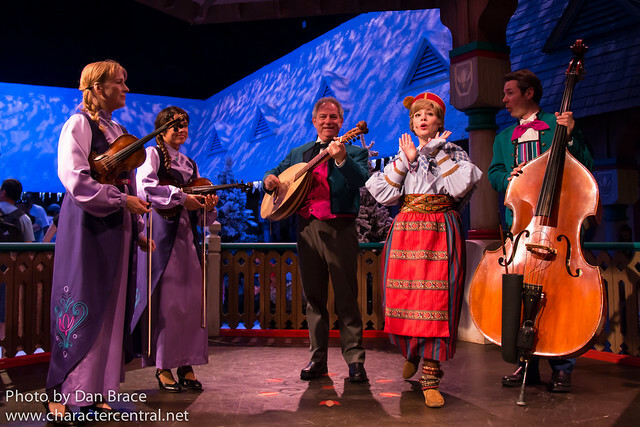 The first picture is of Kikka and the Frolicking Fjords, and the second two photos are of Astrid and the Troubadours. 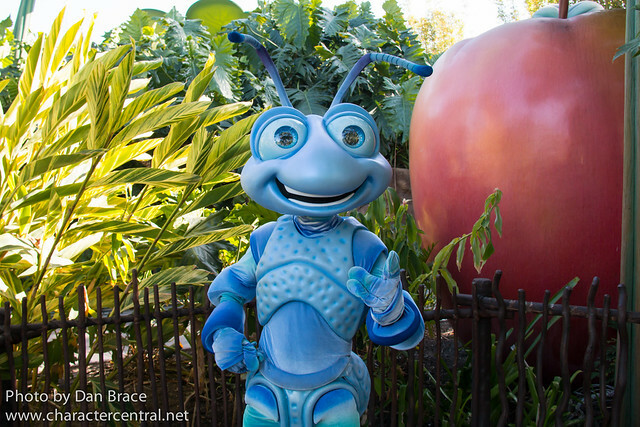 In A Bug's Land Flik was greeting his fan. 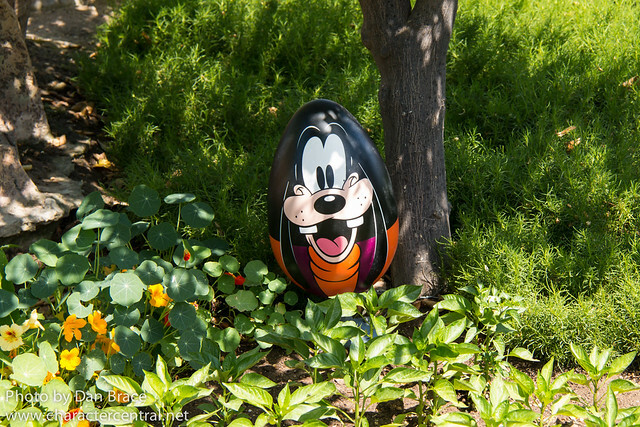 It's always nice to see him in the park. 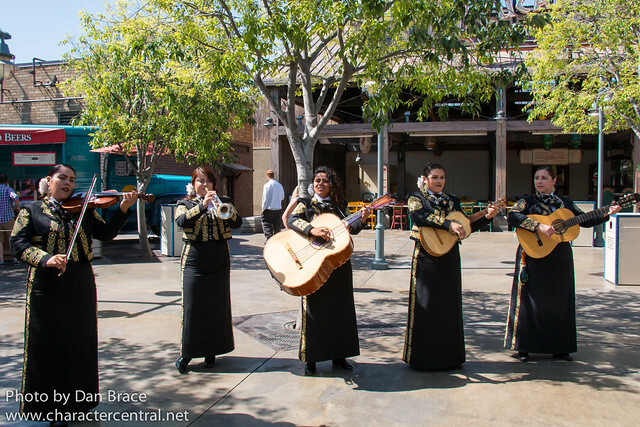 At Pacific Wharf we stopped to watch the very talented Mariachi Divas perform. 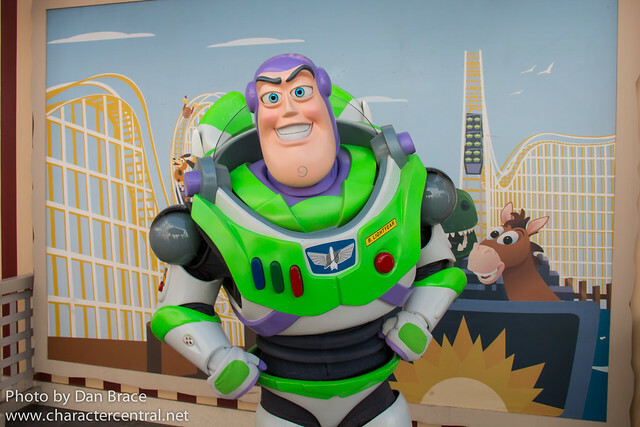 On Paradise Pier we met Woody, Jessie, Buzz Lightyear, and Donald Duck. 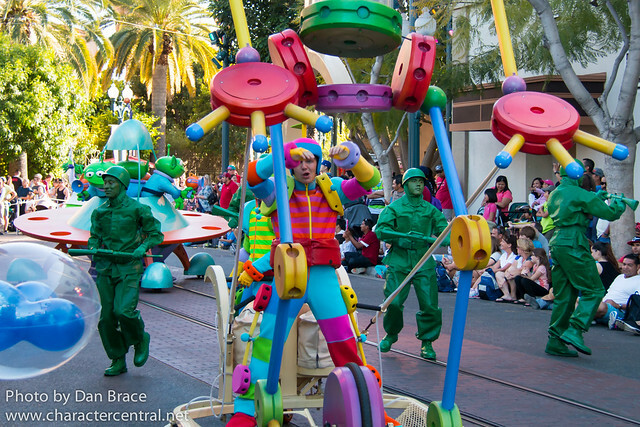 We also stood to watch Operation: Playtime! 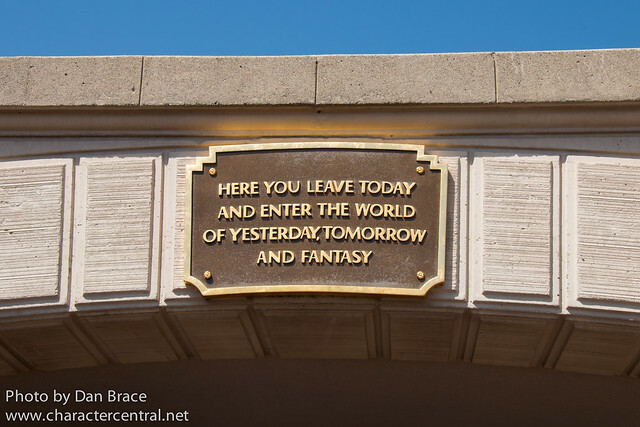 one day. 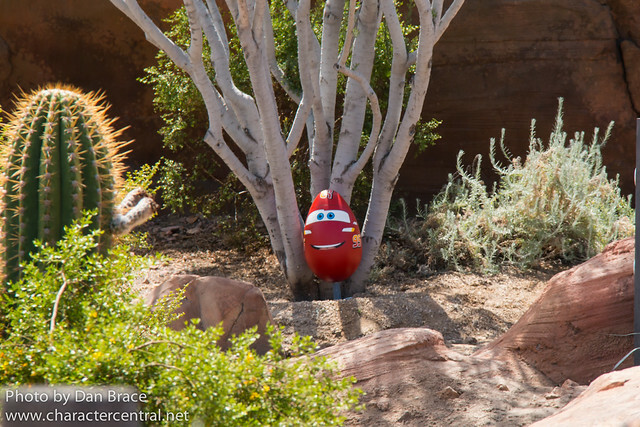 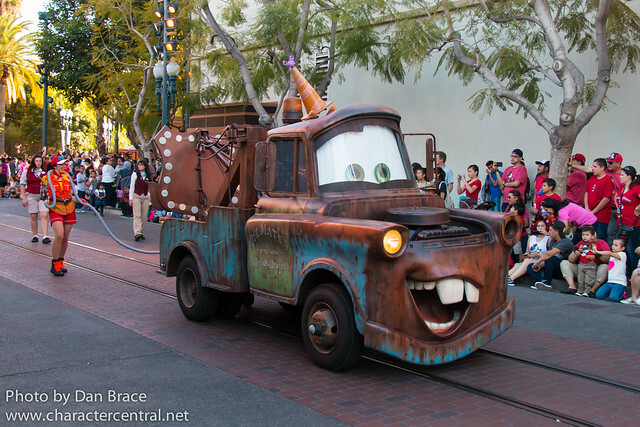 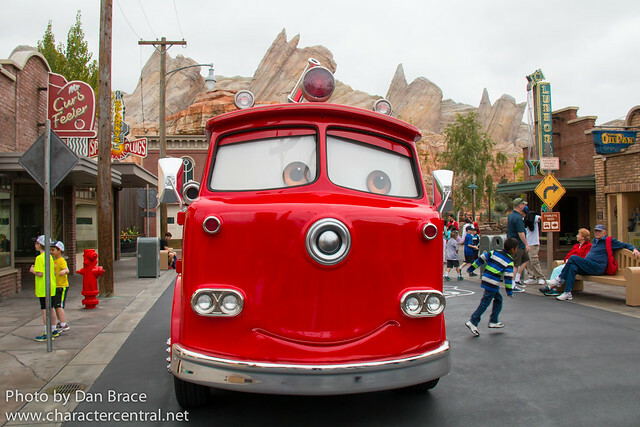 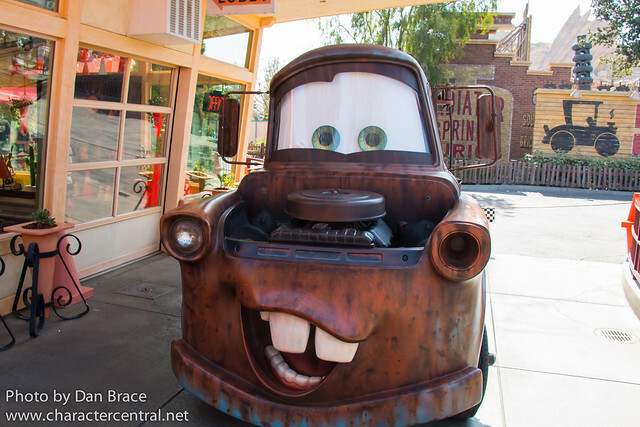 In Cars Land we met Lightning McQueen, Tow Mater and Red. 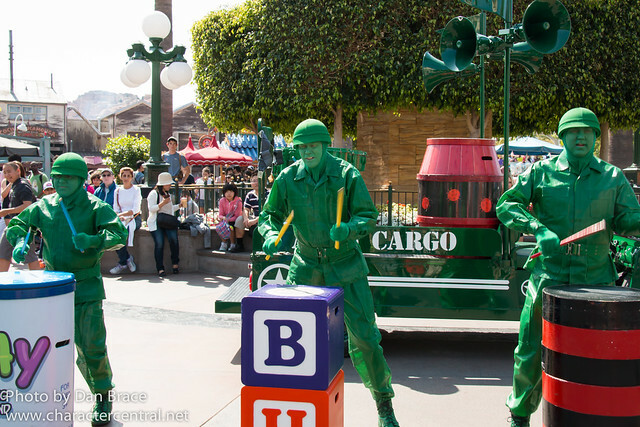 We also wanted to watch DJ's Dance and Drive, which features the little blue car, DJ, but for some reason every day during our trip he seemed to have a mechanical problem that needed Luigi and Guido's attention, so he didn't put on his show. 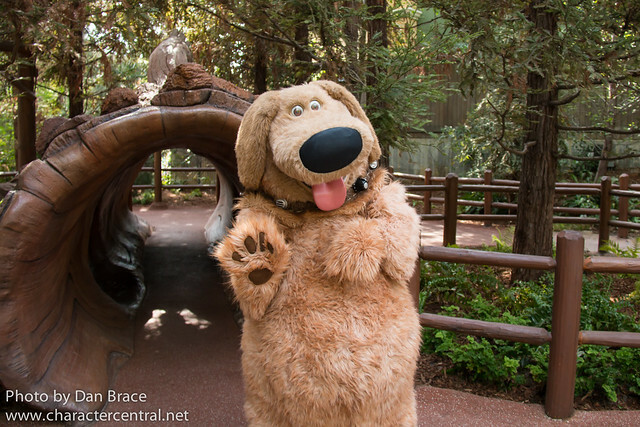 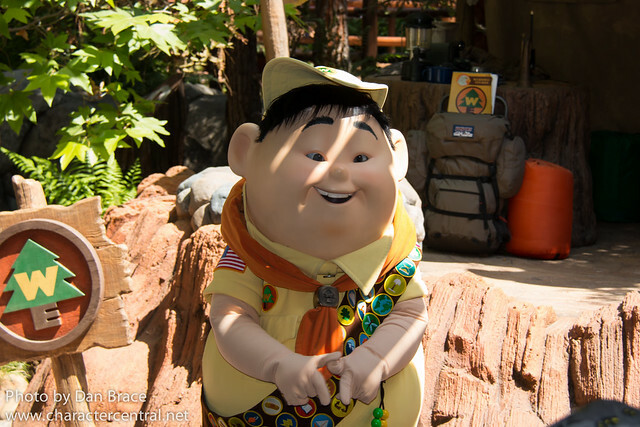 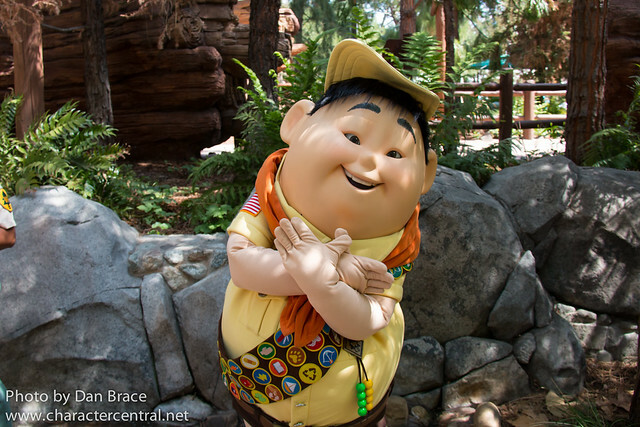 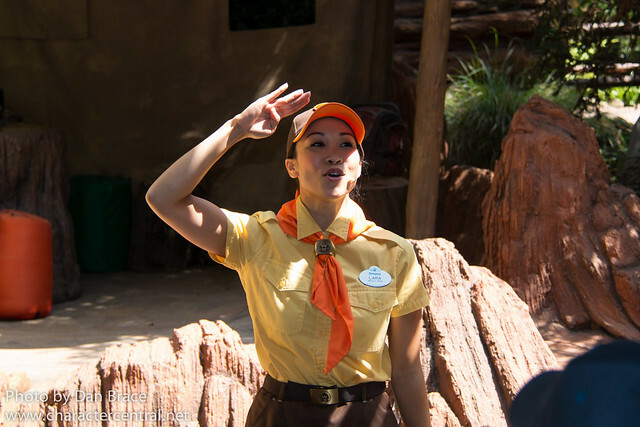 In Grizzly Peak we watched the Wilderness Explorer Ceremony, met Dug and Russell and stood to listen to the Happy Camper. 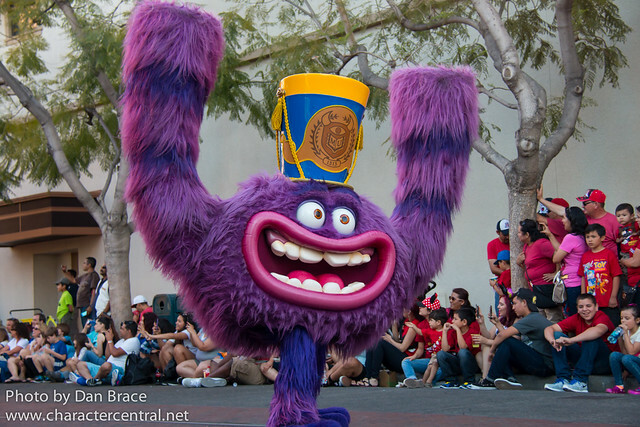 Finally for California Adventure, we watched the PIXAR Play Parade and World of Color. 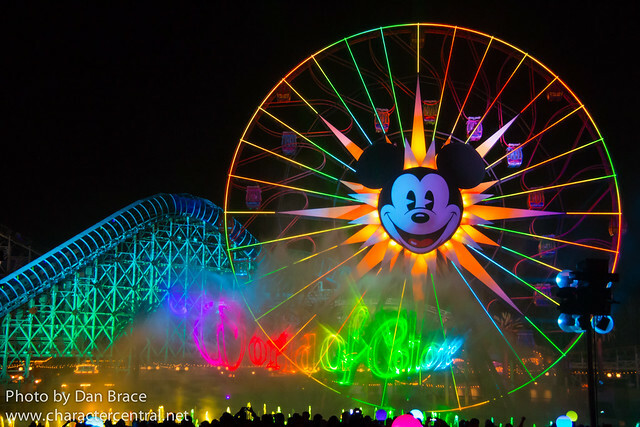 World of Color, like Fantasmic! 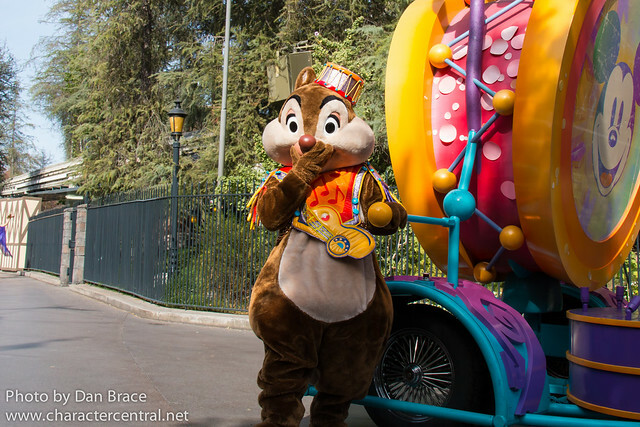 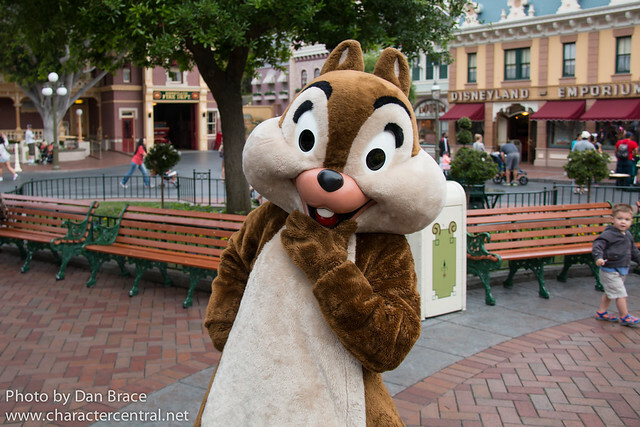 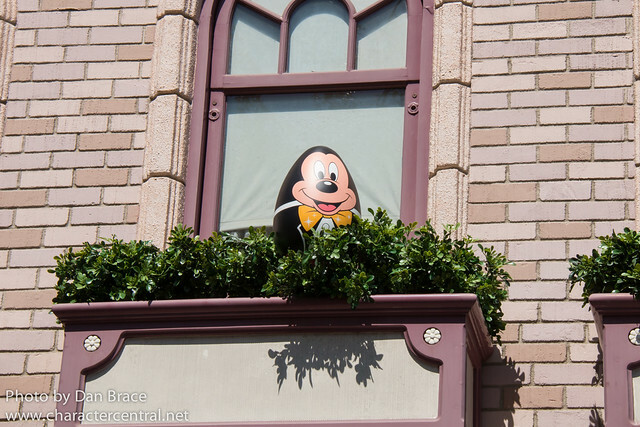 at Disneyland park, is not something we watch often as it is usually a huge hassle. 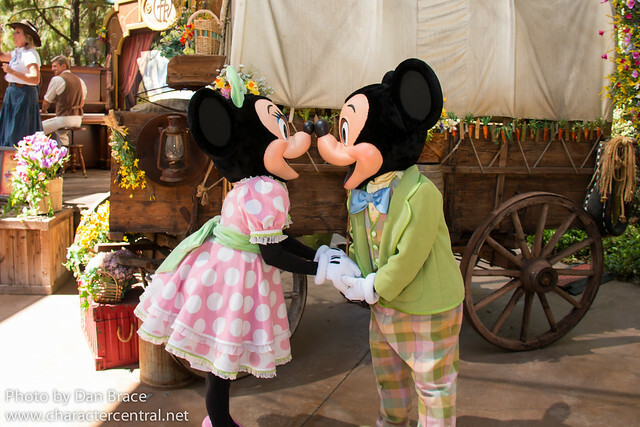 However, we hadn't seen it in a long time, so we made the effort on our last evening. 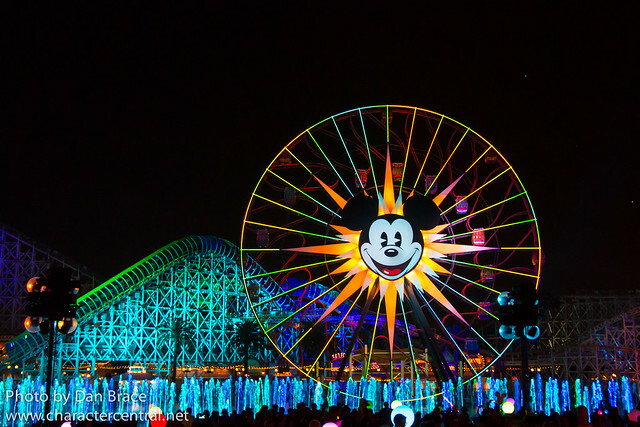 I like World of Color, but I still hold fast to my opinion that Disney Dreams! 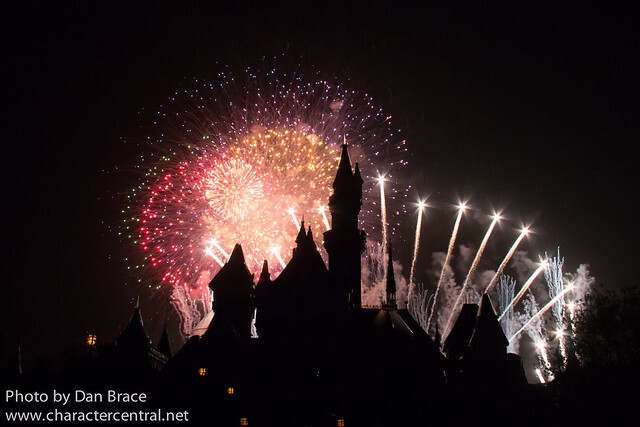 at Disneyland Paris is the best nighttime spectacular ever developed. 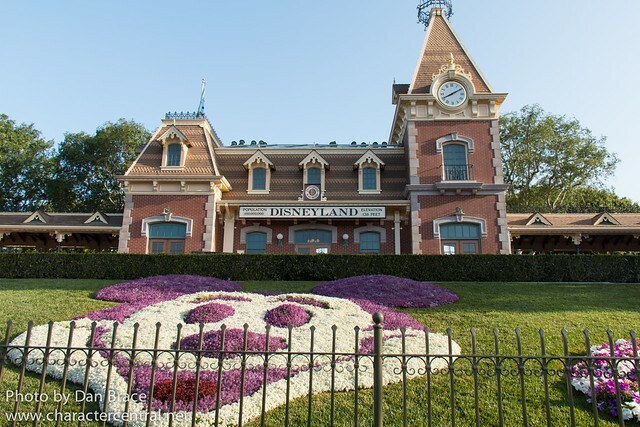 While we we on our trip we also had the amazing opportunity to visit the Walt Disney Studios in Burbank. 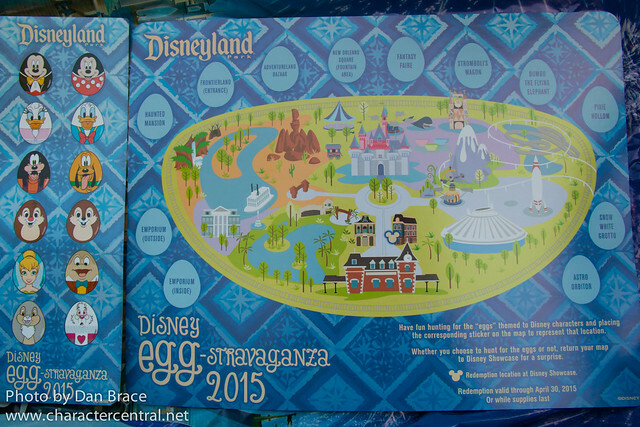 I have decided I will write a separate report about our experience there, so look out for that over the coming days. 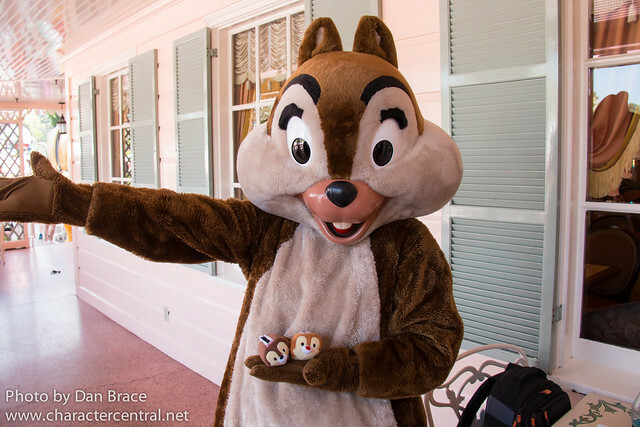 During our trip, we also had some of our little furry Tsum Tsum friends with us. 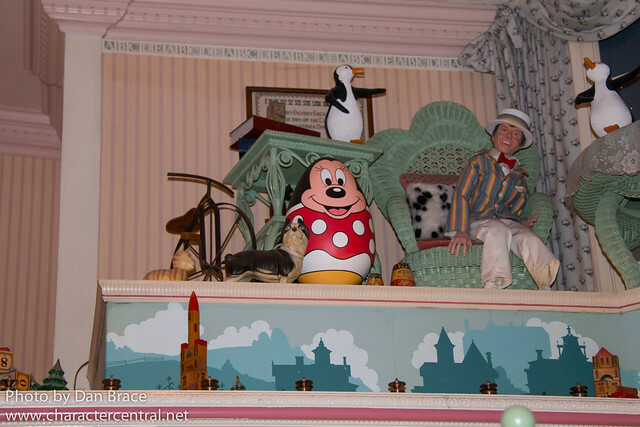 They had a grand adventure of their own, which I shared in a special blog post on our sister website, Tsum Tsum Central. 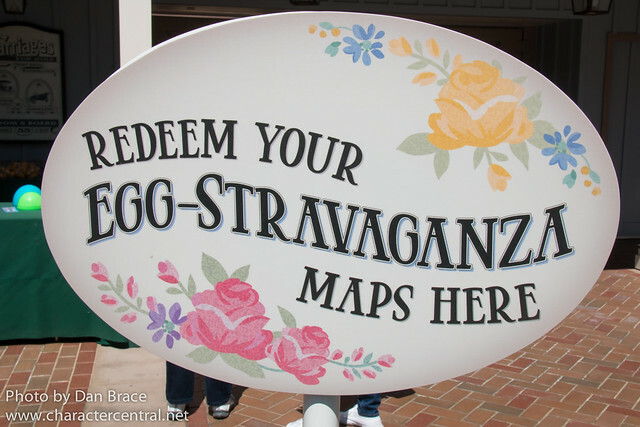 Well, that's it for this trip. 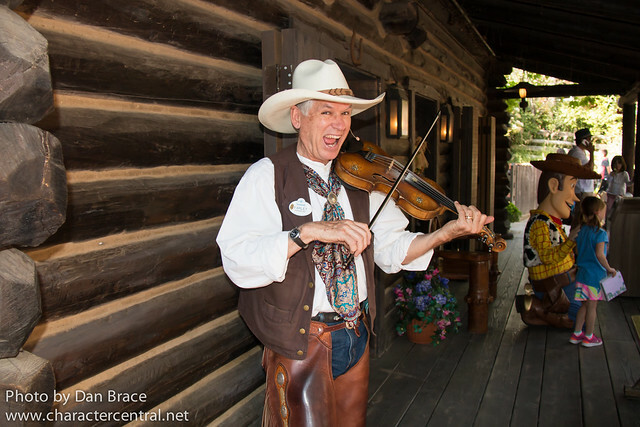 We had an amazing time, as always, and look forward to hopefully returning later in the year!